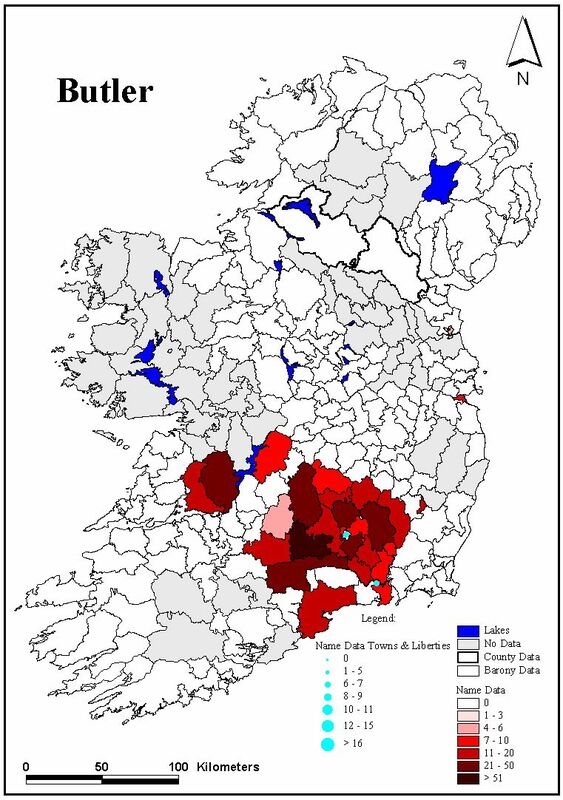 The seeds for this Atlas of Irish Family Names in Ireland project were first sown more than a decade ago, given my interest in using Petty's so-called ‘1659 Census’ to map that distribution of ‘Old English’ and ‘New English/Scots’ names (see Smyth and Whelan, Common Ground , 1988). This census provides a mid-seventeenth century listing, probably unique amongst European countries, of family names and their numbers for each of the Irish baronies enumerated c. 1659. For Ireland, the seventeenth century marks a great rupture in its cultural history. It was then that Irish first and second names—i.e. family names—assumed their anglicised forms that are known and used today. Petty's ‘Census’ record of these family names and their distribution is, therefore, invaluable. 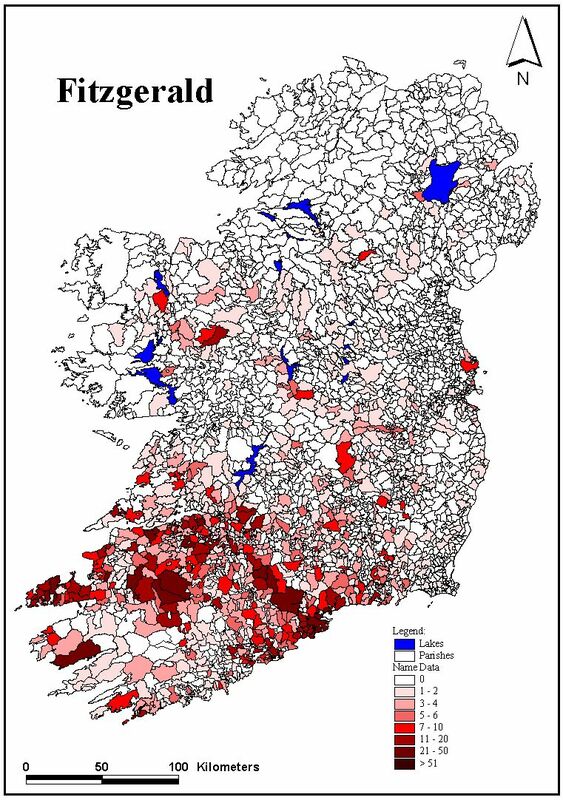 I was then also interested in mapping the current distribution of Irish family names in order to assess their geographical expansion, and the role of migration and urbanisation, in particular, in the transformation of family name distributions since the seventeenth century. With the aid of the current telephone directories for both the Republic and Northern Ireland, I have been mapping up to 50 of the most prominent family names in Ireland. Concurrently, the digitising of c. 3300 Irish ‘civil’/‘medieval’ parishes by the Department of Geography at UCC to facilitate detailed mapping for our Famine Commemoration Exhibition of 1995/96 provided a ready-made and innovative GIS (Geographical Information Systems) platform for other projects involving digital mapping and data display (see Part IV below). The Documents of Ireland component of this Atlas of Family Names in Ireland project (previously entitled Atlas of Irish Names ) has allowed for the selection and digital mapping of over 250 family names at both the baronial scale for c.1659 and at the very intimate civil parish scale from Griffith's Valuation c. 1850 (see Part III below). In sum, this work, represents the mapping of close on ten per cent of the family names of Ireland for the two time-periods specified. A major focus of this phase of the project, therefore, is to seek an understanding of the transformations in names and their distribution between the mid-seventeenth and mid-nineteenth centuries. The sample of surnames selected involved a number of considerations. In 1890, Matheson identified the 100 most numerous surnames in Ireland using data from his Registrar General's files. All these first 100 surnames have been mapped for c. 1850 and, if applicable, for c.1659. In addition, a key consideration of this ongoing project is to seek to identify and interpret (via family names analysis) the originating regions and geographical expansion of a number of key immigrant groups who have settled in Ireland. Clearly the most dominant and most widespread of such surnames relate to the Celtic/Gaelic era and the sample of surnames mapped, therefore, reflects this situation (see Part V and VI). However, a critical concern is the possible use of this data in an attempt to identify the localities where the Scandinavian-Irish, the Anglo-Normans (later Old English) and the New English and Scots settled. Again, the selection of specific surnames to be mapped closely reflected these concerns. For example the surnames Cotter (Scandinavian-Irish); Fitzgerald, Butler, Walsh (Old English) and Bell and Campbell (New English/Scots) are illustrated in Part VI. In addition, the Documents of Ireland phase of the project has allowed for a partial exploration of the origins and expansion of both first and second names in Ireland. Graduate students' work both on the Annals of Ulster and the Annals of Inisfallen has been most helpful here. In seeking to understand this transformation of Irish society in the crucial and innovative naming period from c.800 to 1200AD, their work on the tabulation of occupational stability and change over the period has been most helpful. However, given both time and, more particularly, funding constraints, it has not been possible—as yet—to follow through with a far more indepth and thorough analysis of the linguistic evidence about the origins and development of first and second names in Ireland. This requires the addition of language experts in Old/Middle Irish, Norse and Anglo-Saxon to the project team. It is hoped that future funding will allow for this necessary endeavour. Likewise, funding will be sought to engage genetic anthropologists to carry out the kind of comparative DNA testing necessary to confirm or refute hypotheses about the nature of the relationships—if any—between the bearers of specific family names and their ethnic roots. It is intended to collaborate with Professor Thomas McCarthy of the Biochemistry Department at University College Cork and the Genetics Department at Trinity College Dublin, assuming adequate funding can be found for such a costly endeavour. These kind of studies would be particularly relevant to a more precise evaluation of the nature and geographical extent of the Scandinavian contribution to the Irish stock and culture. The other most positive outcome of this Documents of Ireland part of the project has been that the mapping of all the family names in the 1659 Census has been achieved. This means that a comparison can be drawn in the near future between the distribution of all these mid seventeenth century family names with their mid nineteenth century equivalents via digital mapping from Griffith's Valuation. This will involve, therefore, the mapping of a further c.400 surnames (see Index, Part V). Partial funding has already been gained for this next stage of the project. Once this mapping is completed, it is intended to produce in book form an Atlas for both the full list of 1659 family names and their nineteenth century distributions. Since Woulfe's pioneering early study Sloinnte Gaedheal is Gall—Irish Names and Surnames (1906), and the prodigious and most helpful publications of Edward MacLysaght ( Irish Families , 1957; More Irish Families , 1982 and The Surnames of Ireland , 1985), very little original and sustained research has been carried out on the origins, meaning, ethnic diversity, distribution and geographical expression of Irish family names. This ongoing Atlas project will hopefully both augment and encourage research on this important theme in Irish cultural studies. The completion of this stage of the Atlas project has involved much teamwork and cooperation from many people and many disciplines. I would like to thank Professor Keith Sidwell, Director/Chair of the Documents of Ireland Committee for his care and commitment. A special word of thanks to Project Manager, Ms. Margaret Lantry for all her patience, consideration and technical expertise. My thanks also to all the members of the Committee and to colleagues in the Department of Geography. The project could not have been completed without the sterling work of two dedicated graduate research assistants: Ms. Almar Barry who worked so tirelessly for the first year or more on the project and Ms. Millie Glennon who has been so dedicated in shepherding the project all the way through. My thanks too to graduate assistants Ms. Joanne McCarthy and Ms. Elaine Cullinane for their hard work on the names. Mr. David Joyce is our skilled IT co-ordinator who has integrated the database records and map files most expertly. Cartographer, Mr. Michael Murphy worked his usual magic with numerous mapping requests. I would also like to thank Mr. Charlie Roche who had the patience and craft to transform ‘a paper landscape’ of parishes, baronies and counties into a digital mapping framework. My sincere thanks to both Ms. Orla O'Sullivan and Ms. Suzanne O'Sullivan for all their good secretarial work and to Ms. Rose Walsh, Ms. Noreen McDowell and Mr. Brendan Dockery for administrative assistance. Dr. Neil Buttimer and Kenneth Nicholls were, as always, most helpful as was Dr. Jim McLaughlin. A very special word of thanks to my institutional collaborator at the National University of Ireland Galway, an t-Ollamh Máirín Ní Dhonnchada for both her scholarship and her generosity. Finally, thanks to Ms. Vera Ryan for all her help and support. The Atlas of Family Names in Ireland (originally entitled Atlas of Irish Names ) is a modest project currently being undertaken in University College Cork's, Geography Department. Using GIS inspired computer-based maps of data from both the so-called ‘1659 Census’ and Griffith's Valuation, an historical atlas of the principal surnames of Ireland is currently being constructed at barony and civil parish scales respectively. However, lurking behind this in-house mapping venture is a less modest agenda. Combining evidence from both first (Christian) names and second names (surnames) as well as from placenames, this wider research agenda seeks, through the lenses of these names, to provide a greater geographical understanding of patterns of immigration, settlement and cultural transformation and assimilation since the end of the first millennium to the present. This section provides an introduction to the rationale for both the Atlas and this wider research agenda. The reader/viewer should note that only a small sample of the Atlas maps are presently on-line. Many countries are characterised by not only complicated geological and settlement histories but also by highly uneven, layered and contested symbolic landscapes. Placenames, first names and surnames constitute very distinctive and integral components of a country's symbolic universe. And to the delight of the geographer, such names—given their embedded local qualities—are amenable to detailed mapping—as in the Atlas project—and to distributional analysis. In addition, the naming of individual places and people and the perpetuation of such names in various forms over time and space provide a powerful memory bank for and of a culture. Excavating such a memory bank of names allows the scholar to explore hidden and often undocumented social and cultural processes, which in Evans's apt phrase often escape the net of official history. (1) Names provide very important clues to questions of colonisation, conflict, conquest, accommodation and assimilation. In this Atlas research project, attention will be specifically focused on the first names and second names of Ireland in the past millennium. The analysis of placenames is another day's work, although there is a strong interlacing of family and placenames and some of these interconnections will be touched on briefly in the conclusion. To provide a scaffolding for the discussion it is argued that for the past 850 years or so the forging of Ireland's symbolic universes has seen an ongoing and oscillating battle, conducted mainly between two powerful hegemonic forces: that of the Celtic/Gaelic/Irish and that of the Germanic/British/English-speaking/writing traditions. Part I looks at the origins and consequences of these battles and encounters for patterns of first names and the creation of second names. Part II explores the geographical transformations in second names consequent on the clash of these two hegemonic forces. Part III addresses issues of attrition, mediation and hybridity by exploring the changing geography of the ‘O’ and ‘Mac’ forms amongst Irish surnames. In all three sections, the evidence from seventeenth-century data sources (mainly written in English)—and especially that of the ‘1659 Census’—are used as a crucial vantage point from which to view and chart the ebb and flow of naming patterns as key signifiers of change, conquest, adaptation, transformation and revival. Irish language-sources and discourses are equally crucial. Unravelling the territorial domains of first and second names, therefore, is only part of the story. Complex linguistic terrains and interfaces and competing terrains of discourse must also be traversed and addressed. And just as the sources provide narrow, uneven and darkened windows on the past, so in this venture I must select, emphasise and obscure to tell my story. The so-called ‘1659 Census’ provides a unique vista of Ireland at one of the most pivotal points in Irish political and cultural history. (3) Apart from providing a detailed, almost island-wide picture of settlement, ethnic groups and population distributions in the mid-seventeenth century, it also facilitates both a retrospective reconstruction of ethnic patterns of settlement created in earlier centuries as well as providing a crucial benchmark against which to measure later cultural transformations in the eighteenth, nineteenth and twentieth centuries. Inspired by William Petty's obsessive concern with the ratio of Irish to English in each barony and county, a most crucial component of the ‘Census’ is the listing of the principal family names at the end of each baronial entry. Unfortunately the returns from counties Cavan, Galway, Mayo, Tyrone and Wicklow as well as parts of Cork and Meath are missing. Otherwise the ‘Census’ records for every other county and barony the specific numerical importance of each family name classified as ‘Irish’, from the most numerous down to the family names which were enumerated at least five times in the poll-tax barony lists. It is unlikely that any other European country has a seventeenth-century record of such geographical richness in relation to the number and importance of such a range of family surnames. Whatever about its uniqueness, this baronial listing of principal Irish family names has provided an essential anchor for this Atlas project. For example, this listing of surnames allows the researcher to identify and map the distribution of the descendants of the Anglo-Norman settlers who are increasingly known as the ‘Old English’ by the mid-seventeenth century. Surnames included here are Barry, Brannagh, Browne, Burke, Butler, Croke, Fitzgerald, Fitzmaurice, Fitzsimon(s), Nagle, Power, Redmond, Roche, Russell and Tyrrell. All these surnames are included in the Atlas project. Figure 1, therefore, seeks to map the relative distribution of the Gaelic and Old English surnames in 1660. (4) What is revealed is a whole series of territorial polarisations and gradations in the distribution of family names. 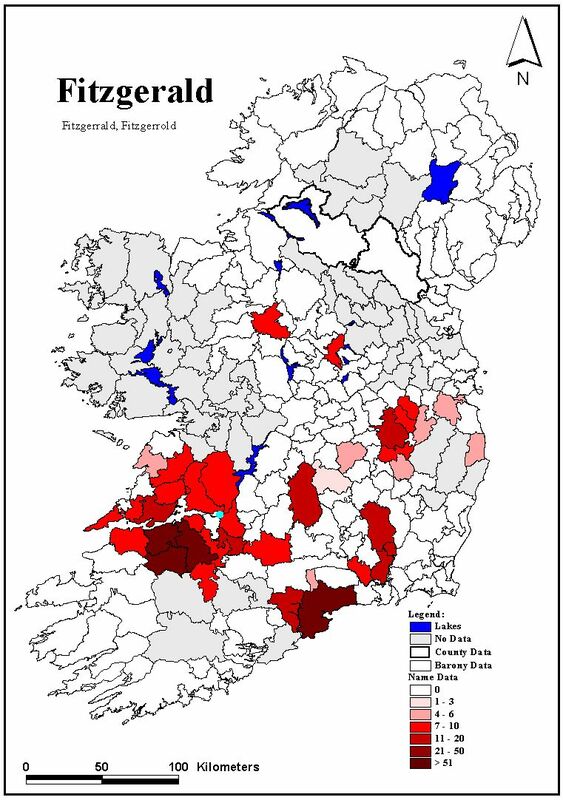 The ‘Old English’ Pale area is confirmed with the Boyne valley as a crucial axis. 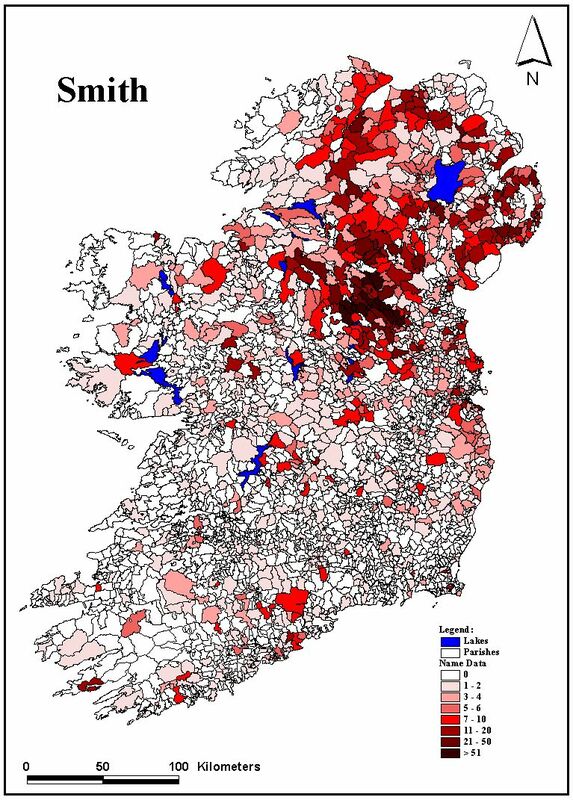 In sharp contrast, the strength of the population with Gaelic surnames over much of Louth, South Dublin, North Wexford and most particularly Kildare is striking. The mid-seventeenth century surname evidence also confirms the spread of medieval settlement and culture by the Anglo-Normans in south-east Ireland. 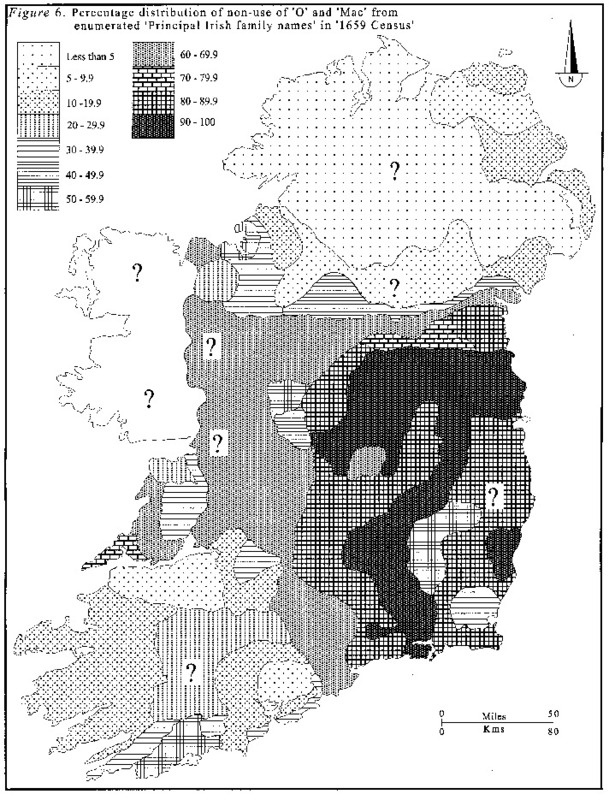 Outside of the north-west and the south-west of the province and the hills of Tipperary, Figure 1 also illustrates the strength of Norman naming patterns over much of Munster. 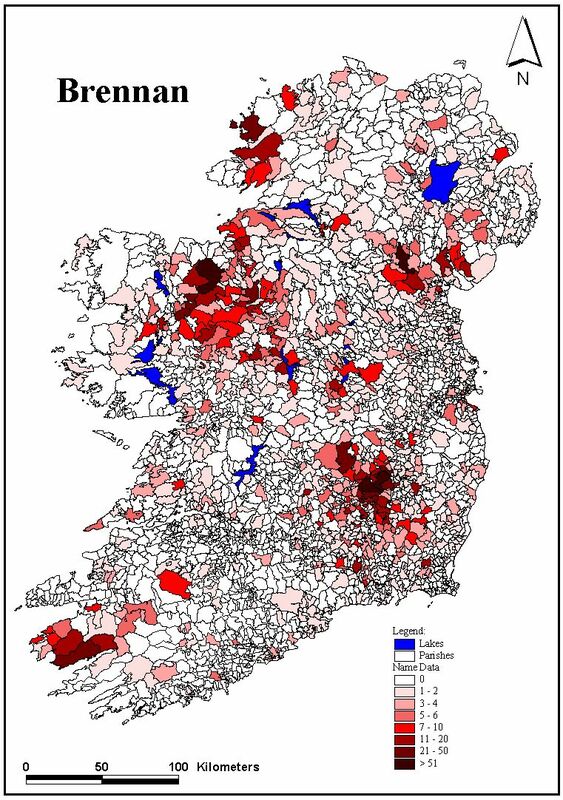 But what this map fails to reveal is the subtle gradations in the forms of the Anglo-Norman names as they work their way inland and westwards into such highly Gaelicised lands as North Kerry, not to speak of the naming and cultural permutations that characterize Connaught. The strength of the Gaelic tradition so close to Cork City is another striking feature of Figure 1. (Viewers/readers will note that Figures 1 to Figure 7 are attached to the end of this Section II). Indeed the Gaelic hearthland of the southwest is as clear and as extensive in 1660 as it was in 1260. 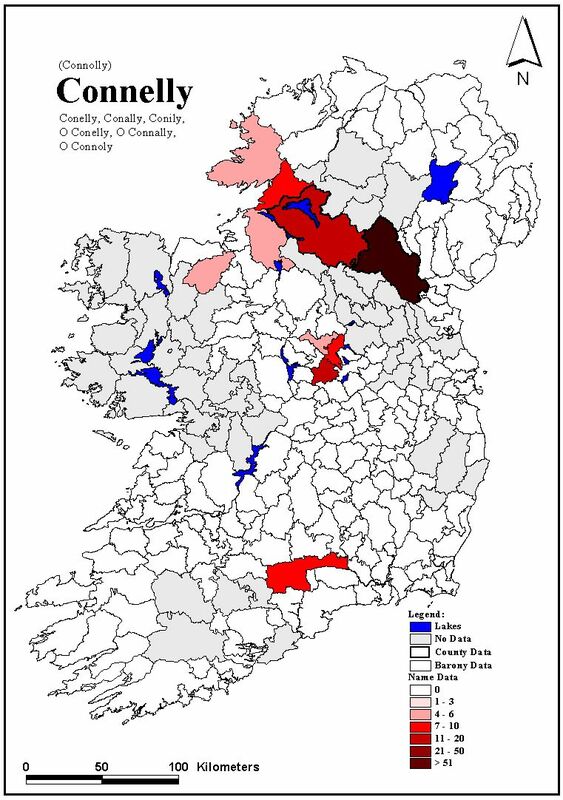 The inland Gaelic worlds of Laois-Offaly and its borderlands is also made clear as is the weak Norman surname imprint in the wetter lands of North Connaught, Northwest Leinster and all of Ulster, exclusive of East Down and Antrim. 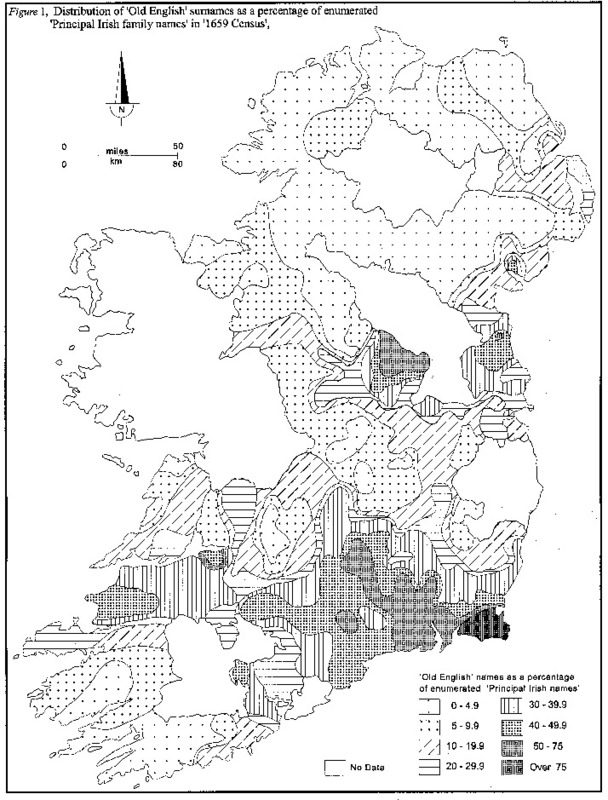 East and North Cork, North Kerry, most of Limerick, mid-Tipperary and South Laois as well as all the lands bordering the North Leinster Anglo-Norman core constitute a middle ‘marchland’ zone where the most coveted lands were fought over by Norman and Gaelic and where, as Jones Hughes has argued, (5) the deepest levels of assimilation between the two traditions emerged. In short, Figure 1 confirms both the great regions of ‘the Irishry’ as they were known in the later Middle Ages as well as the regional diversity, demographic power and resilience of Old English worlds as they persisted into the first half of seventeenth-century Ireland. Other questions can also be asked of the ‘1659 Census’ and associated data-sources relating to levels of assimilation as between the ethnic ‘Irish’ and the ethnic ‘Old English’ by the mid-seventeenth century. The myth that the Normans became more Irish than the Irish themselves became deeply embedded in the Irish psyche and Irish historiography after the mid-seventeenth century. (6) Evidence from the hearth money records as well as the ‘Census’ is helpful in testing the validity of this long-assumed pattern of acculturation which emphasised the capacity of Gaelic Irish culture to assimilate and incorporate the culture of the descendants of the medieval settlers known as the Anglo-Normans. One of the most comprehensive and most accessible of the county hearth-tax records is that edited for Co. Tipperary by Laffan. (7) In these records, not only are the surnames specified but so also in magnificent detail are the Christian/first names. Again it is not too difficult a task to distinguish between the Gaelic surnames and those of Old English ancestry. Likewise one can map parish by parish the first or Christian name patterns associated with the descendants of the two ethnic groups. And these hearth money records can be compared with specific materials in the ‘1659 Census’. If the thesis or myth that the Normans became more Irish than the Irish themselves is correct, one might expect that over the more than four hundred years of conflict, interaction and assimilation between the two groups, at least some of the Old English families would come to carry first names which had been borrowed from the Gaelic naming stock. The first name evidence from the hearth money records for Tipperary emphatically denies that such a process of acculturation occurred. Apart from a small number of smaller or upland parishes (but interestingly including the parish of Whitechurch where Seathrún Céitinn / Geoffrey Keating was born), the families of Anglo-Norman descent stubbornly retained their own naming patterns modelled on a European/universal saints naming heritage. Thus, in over 90% of the parishes of Tipperary, there is a 95-100% retention of such saints' names by these families. Amongst the Old English of mid-seventeenth century Tipperary, Christian first names such as Alice, William, Nicholas, Edward, Claire, Richard, David, Isobel, Hanora, Catherine and Henry ruled supreme. The descendants of the Anglo-Normans may have borrowed freely when it came to matters of poetry, song, music and indeed language. But they certainly yielded very little symbolic territory in their use of Christian first names. And when it came to issues of property in land or the Church or the professions generally it is, likewise, doubtful if they yielded much ground. This conclusion is further confirmed when we examine first naming patterns amongst the descendants of the ‘Old Irish’ i.e. amongst the Ryans, Meaghers, O'Kennedys and O'Dwyers (all mapped in the Atlas project) and others of ‘Gaelic’ stock. In contrast to the solidity and county-wide consistency of the Old English first names, the pattern of Christian names amongst the Gaelic families (Figure 2) very closely mirrors the underlying property and political structures. 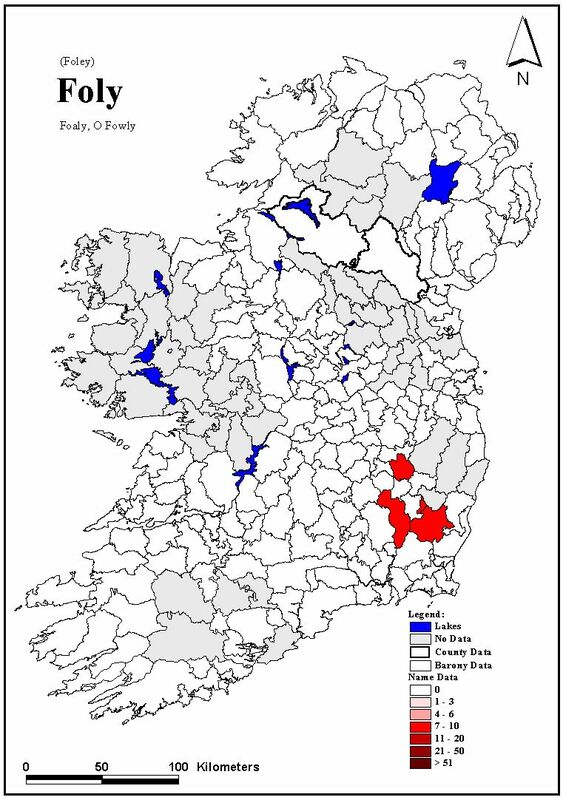 In the North and West of Tipperary where Gaelic lords had remained in situ during the medieval period or, as in the case of the O'Kennedys, had expanded their domains during the period known as the Gaelic resurgence, Gaelic first naming patterns had remained most intact. Here, names such as More (Mór), Hugh, Owny (úna), Sheely (Síle), Dermot and Teige were in a majority. Yet even in these ‘Gaelic’ regions, assimilation to medieval European-derived naming patterns is still noticeable with a 10% to 20% adoption rate. Nevertheless the resilience and strength of Gaelic resistance is epitomised by a number of frontier parishes such as that of the O'Fogartys of Inch in the Thurles region and that of the McGraths of Whitechurch near Cahir. As with the intermixed Irish/Old English land-ownership patterns, first naming patterns are transitional in character amongst the Gaelic families across the middle bandolier of territory from Ikerrin in the northeast to Clanwilliam in the southwest. (8) But in South and East Tipperary, especially in the baronies of Iffa and Offa East and West, Middlethird and Slieveardagh—in a powerful Anglo-Norman zone of colonisation and property control, under the aegis of the Butler overlordship—the deeper feudalisation of the ‘Old Irish’ population and their naming patterns is clearcut. In many of these south-eastern parishes less than 50% of the ‘Gaelic’ families carry the more traditional Gaelic first names. In this more urbanised and manoralised village world, first naming patterns amongst the ‘Gaelic’ families were modelled much more on those of the Anglo-Norman lords and their principal tenants. Not only had the Normans not become more Irish than the Irish themselves; rather the cultural tide was running in the opposite direction in sixteenth—and seventeenth—century Ireland with the adoption of Old English naming patterns by families of Gaelic descent. However it is also relevant to note the large transitional zone in the middle of the county where Gaelic and Norman cultural forms met and fused to a greater extent. Cultural hybridisation is also a feature of late medieval/early modern Tipperary. The ‘1659 Census’ does not provide the same richness of data on Christian/first names. Yet its detailed listing of the first and second names of the highest poll-tax payers, the ‘tituladoes’, i.e. the gentry, the professionals, the merchants, is also highly instructive. 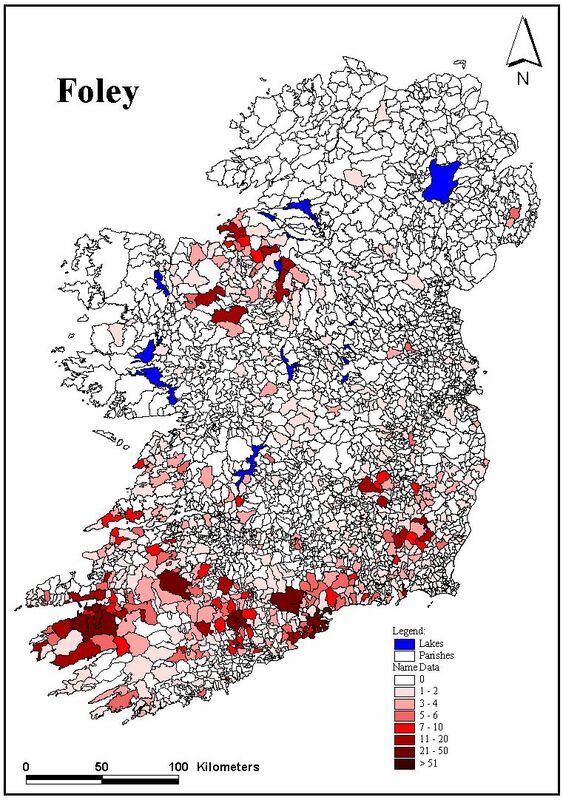 Again it is not difficult to distinguish the ‘Old Irish’ gentry names from those of the Old English and one can map, as in Figure 3, the extent to which the old Gaelic elites retain their ancient first names or have adopted European-wide medieval patterns of Christian names. 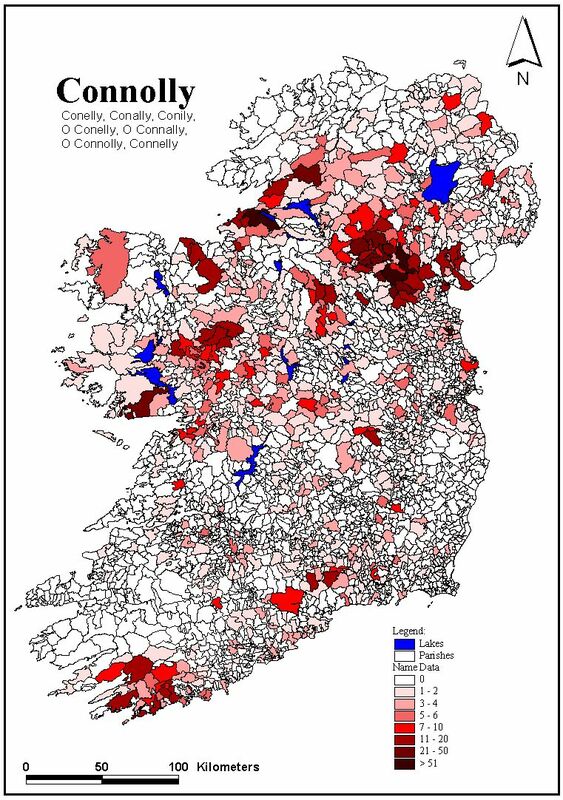 One can test also the reliability of the results by looking at a comparison of the Tipperary patterns based in the first instance on the very detailed hearth money records and secondly on the less comprehensive gentry/'titulado' naming patterns in the ‘1659 Census’. 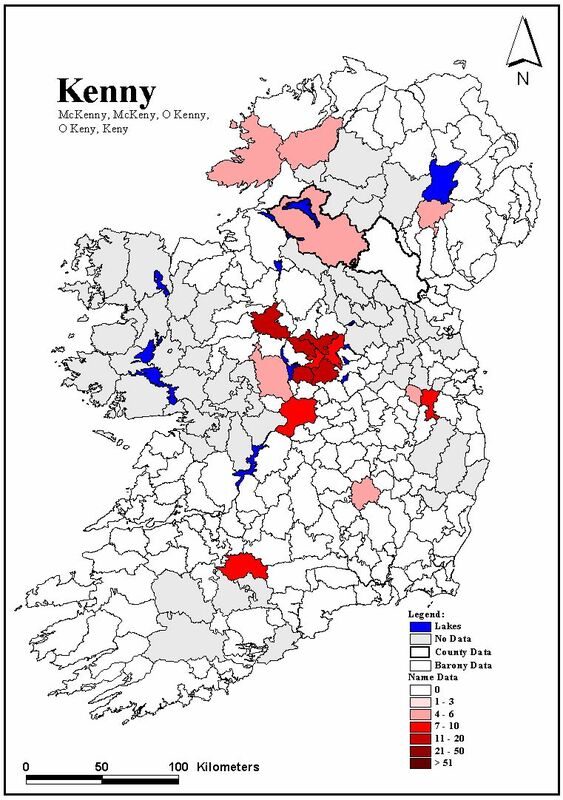 A very high correlation between the two sources is evident in the three naming regimes revealed for Co. Tipperary—the more Gaelic north and west, the hybrid middle belt and the very ‘feudalised’ south-eastern zone. This latter region is seen to extend over much of lowland Leinster, presents a sharp frontier to the Gaelic world of Ulster and its borderlands in Leinster and Connaught, extends into Normanised Roscommon and swings south to reveal the cultural zones of high assimilation to medieval naming patterns amongst the Gaelic families of both East and North Cork and North Kerry. The long recognised frontier zone between Desmond North Kerry and Gaelic South Kerry is replicated on this map—a Gaelic zone of continuity which extends into West and South-West Cork with again (as in Tipperary) a classic hybrid marchland zone running north-south in mid Cork from Liscarroll to Kinsale. 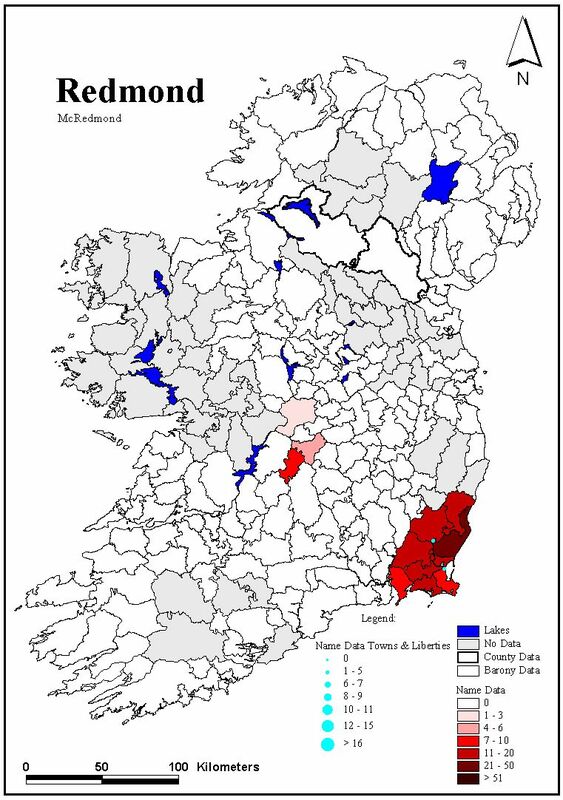 Likewise pockets of greater resistance to European naming patterns are revealed in parts of the Midlands, the Decies in Waterford and in North Wexford (and probably much of Wicklow). County Clare reveals mixed, if more Gaelic-naming, patterns which probably weakened as this zone extended into lowland Galway and Mayo. 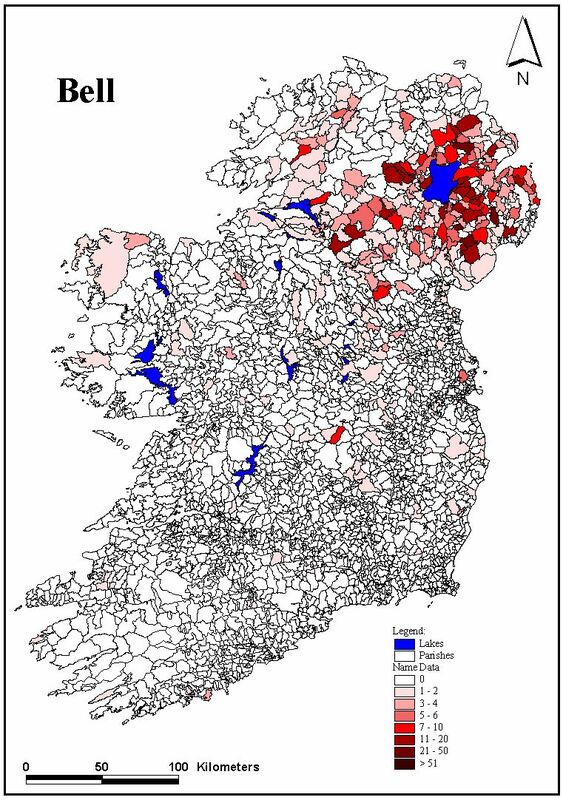 However, the most striking feature of Figure 4 is the emphatic regional distinctiveness of Ulster and adjacent borderlands. Nowhere else does the pattern of Christian names remain so faithful to its ancestral roots. Nowhere else in Ireland was Gaelic culture more coherent, more conserving, more enduring. Overall, therefore the first name evidence from mid-seventeenth century Ireland as a whole reveals how diverse and regionalised Irish cultural expressions had been at this time. And it is clear that over the greater part of the island (excluding Ulster) medieval Christian naming patterns had taken a deep hold—a feature even more pronounced amongst women where Christian names reveal a greater shift towards the more fashionable European first names than even those of the men. For example, in Co. Tipperary of the mid 1660s, fewer than 20% of the women's first names belong to the older Gaelic naming tradition. The Anglo-Norman colonisation and the associated great increase in continental religious foundations had clearly a profound long-term transformational effect on culture and naming patterns. This is not to argue, however that the more universal saints names had not penetrated into Irish life before 1169. The Christian names Michael and Paul began to arrive after 1020 while Edmund, John, Margaret, Maria and Nicholas also make more fleeting appearances before 1120. Yet there is no doubt but that the full introduction of the great swathe of continental saint names awaited the coming of the Anglo-Norman knights and their religious orders. Likewise this is not to argue that the first naming tradition of the Gaelic population had remained carved in stone in the pre-Norman period. To explore this world in greater depth the use of Irish-language sources is essential. ó Corráin and Maguire have written that the early Irish had an extraordinary variety of personal names. (9) As many as 12,000 such names are documented in early Irish sources, many of which fell out of fashion at a very early stage. Over the period 770 to 1120, the Annals of Ulster alone record the use of well over 1000 individual, admittedly mainly aristocratic/royal, first names. (10) Analysing the composition and distribution of these names over 50 year intervals from 770 to 1120 provides a useful initial strategy to interpret continuity and change in Irish Gaelic personal naming patterns in that highly significant period and beyond. As many as 416 first names are recorded in the Annals of Ulster for the period 770-819; the average for the subsequent six 50 year periods to 1120 is 258. The greatest range and the greatest number of first names emanate therefore, from the earliest period analysed. However equally relevant is the apparently high attrition rate in the names recorded between 770 and 819—as many as 280 (67.3%) of these first names are not recorded in use in the next 50 year period from 820 to 869. In fact, over the whole period from 770 to 1120, 638 first names are recorded as being in use for one period only and of these rarely recorded names, over 30%, ‘died out’ in this period 820-869 alone. Indeed 48.3% of the first names recorded in the Annals of Ulster between 770 and 819 do not recur in subsequent periods. The attrition rate for first names for all of the other subsequent periods ranges from 24.5% from 820 to 915 to 36.9% from 1070 to 1120 with the average set at 28.5%. The most dramatic transformation in both the number and variety of first names seems to take place in the ninth century. Powerful continuities in first name use are also attested in the Annals of Ulster (AU). At least 18 first names are recorded as occurring in all eight 50 year periods to 1120, close on another 20 for all of seven 50 year periods, over 20 for six periods, close on 30 for five; 50 first names are recorded for at least four 50 year periods, over 70 for 3 and over 150 names are recorded as recurring in at least two of the selected 50 year periods. Some of the great enduring names are Aed, Aengus, Cathal, Cellach, Colmán, Conchobar, Congalach, Cormac, Diarmait, Domnall, Donnchad, Flann, Muirchertach, Muiredach, Murchad, Niall, Ruadrí and Tadc (see appendices). O'Brien's frequency list of the commonest names found in the period 400-900/1000 (both the latter are given as terminal dates) provide both a useful comparison and contrast. (11) The actual number of names (1200) he classified is very close to the AU total discussed here. Ten of O'Brien's ‘top 20’ are replicated in the AU list, led in both cases by Aed (250) and also including Cormac (100), Domnall (100), Flann (100), Cellach (90), Muireadach (90), Colmán (71), Diarmait (70), Conchobhar (60) and Murchad (54). By way of contrast ten of O'Brien's other most frequent names are displaced in the AU list by names such as áengus, Cathal, Congalach, Donnchad, Muirchertach, Niall, Ruaidrí and Tadc. However, with the exception of áengus, all of the latter names do appear in O'Brien's list, usually at a frequency of 30 to 40. The significant differences between the two lists relate mainly to two rather different chronologies, the wider range of sources used by O'Brien and the significant shift in fashions of naming after 900AD. Of these strongly enduring names, Aed (later anglicised Hugh) is as equally and massively popular in the twelfth century as in the eighth century and becomes one of the great Gaelic revival names in the late medieval period. (12) áengus, while a strong name in the first period, is gradually losing ground in the tenth and eleventh centuries, in contrast to Cathal, which is equally strong both before and after 970. Both these first names were to anchor surname forms in later centuries. Cellach, on the other hand, though remaining popular is only recorded half as often in the tenth- and eleventh-century Annals, although it again was to become a strong surname. Colmán shows a similar weakness as a first name in later centuries of the first millennium. Conchobar is one of the great consistent names, as powerful in the eleventh and twelfth centuries as in the eighth and ninth centuries to become one of the great first and second names over the second millennium (see Figure 4 below). In contrast, Congalach is again only half as powerful after 970 than it is before. Cormac is equally becoming much less fashionable in the later centuries of the first millennium but nevertheless survives to anchor a key Irish surname (see Atlas Extract, VI) and first name. The name Conn is five times more likely to appear in the AU before 970 than afterwards but is revived to become the cornerstone of the key surname ó Cuinn/ (O)Quin(n). Both Diarmait and Donnchad were the other great consistent first names (and second names) equally popular in all centuries. In contrast, while already a powerful name from at least the eighth century, Domnall grows three times as fashionable after 970 to become one of the most influential first and second names, showing further strength in the late medieval era of re-gaelicisation. Flann takes the opposite path with a sharp burst of popularity after 970 (see high kings of the same name) but after this time is less often recorded yet it becomes the root of a highly poplar surname O'Floinn/(O')Flynn. The name Muirchertach is rather rare with five recordings only by 920. Subsequently it becomes highly favourable with close on 80 recorded occurrences in the AU between 920 and 1120. Later on it becomes an anchor surname. Muiredach is another of the very strong stable names across all these centuries while Murchad, in contrast, is almost twice as popular after 970 as before. Niall, while remaining fashionable, dips somewhat out of favour in the latter half of the 11th century. However, the much larger sample of first names for the Annals of the Four Masters shows Niall continuing to function at a select, steady rate in the later Middle Ages. The name Ruadrí is three times as likely to occur after 1020 than before while the name Tadc gathers power as the centuries pass to become one of, if not, the greatest name of the regaelicisation period of the later Middle Ages. The name Pátraic/Patrick presents a striking and challenging scenario. The name slowly gathers momentum up to 970 and is afterwards three times as popular. However the epic story of the cultural geography of the name Patrick is still to be researched and written. Mac Lysaght, using late medieval/early modern sources, notes that while Patrick was not very commonly linked with Gaelic surnames before the sixteenth century, it is still tenth in popularity as a Christian name for that century and is equally as popular amongst the families of Anglo-Norman origin.13 In medieval times, Patrick is still amongst the twenty-five most enumerated first names in English language sources but not as strong in sources such as the Annals where Giollapatrick (later surname Gil/Fitzpatrick) is the more popular form. The hearth money records for Armagh shows the name Patrick already deeply rooted in this north-eastern region by the mid-seventeenth century. (14) It is also clear that the name Patrick had earlier assumed great popularity in Western Scotland and its islands and becomes a significant first name amongst the settler communities who came into Ulster in the seventeenth century. However, the likely greatest surge in the use of Patrick may be linked to the growth of both St. Patrick's Day as the key national festival and to the whole nationalist awakening from the late eighteenth century onwards. Nevertheless, a thorough analysis of its geographical growth in Ireland (and further afield) would provide critical insights about phases and patterns of cultural transformation across Ireland and beyond. Other very popular names in later eras such as Mary, Brigit and Brian only begin to become fashionable in the late tenth and early eleventh centuries. Aedán, now popular again, fades out before 970 in the Annals of Ulster while Fergus remains a solid minority name right through the seven periods studied and undergoes a further resuscitation in the regaelicisation phase of the later Middle Ages. Conall, Fiachra, Fergal and Guaire appear to die out rather early in the AU. The Viking name lmar gathers strength from the mid eighth century and peaks from the late eight to the tenth centuries. The Nordic name Ragnall is also tenacious throughout six of the 50 year periods after 820 and Ualgarg and Sitriuc even more so. Less enduring Nordic-derived first names include Artur, Barid, Bruadur, Gofraid and Sigfrith. The Irish-derived name forms Dubgall and Glún-Iarainn also become popular. Lochlainn becomes quite a fashionable first name from the beginning of the eleventh century onwards. By then it is clear that Scandinavian-Irish names have long been assimilated into the Gaelic-Irish tradition. In contrast a large number of fairly important early names cease to be recorded after 920 or 980; these include Artgal, Colgu, Congal, Crunnmael, Eochu, Forbasach and Suairlech. Overall, over 40% of the stock of first names in use c.1120 in the AU were already in existence prior to 820 and each subsequent 50 year period to 1120 adds from 8% to 12% to this stock. Mapping all these first names across all the 50 year periods from 720 to 1120 reveals a number of key general trends. Firstly, quite a number of names such as Ailill, Bran, Congal practically disappear from these Annals after 820 or 870. There is severe attrition on many long-established names at this time. Secondly, even the very strongest names such as Aed, Cellach, Cathal, Conchobhar, Diarmait and Máel Sechnaill also suffer a temporary decline—sometimes severely as in the case of Cathal—after 870. The most pronounced period of decline in the strengths of all these key first names lies between 920 and 970, followed in many cases by a clear record of resurgence for the late tenth and eleventh centuries onwards. Thirdly a number of names buck this downward trend between 820 and 970 and actually continue to grow in popularity; these include Colum, Domnall, Niall, Muirchertach, Pátraic and Flaithbertach. This same period (820-970) sees the growth of new Nordic names such as ímar, Ragnall and Sitriuc. The above combination of names is strongly in the ascendancy from 820 to 870; older first names gradually regain the upperhand afterwards but there is a kind of equilibrium between old and new name forms from 870 to 1020. Fourthly, there is clearly a resurgence of long-established names in the eleventh and twelfth centuries and some names that had almost disappeared from the record reappear. These include Bran, Cernach, Meal Dúin and Ruaidrí. And fifthly the Christianisation of first names mainly occurs after 970. There is thus evidence of both strong continuities and striking fluidities and discontinuities. Four out of ten of first names in use c.800 are still in use c.1100. Yet six out of ten of the total number of first names are recorded for only one of the 50-year periods in the AU. Overall there appears to be a significant phase of cultural transformation expressed between c.820 and c.970, followed by a major resurgence of long established old Gaelic names after 970. Then follows a trend towards greater stabilising of first names after 1000. This stability may also be strongly related to the spread of hereditary surnames and the consequent reduction in the need for a greater variety of first name forms. There are some parallels in the later impact of the Norman conquest in the high Middle Ages which depressed the status of local Gaelic names and saw the powerful spread of universal saints names as first names. For example, ó Cúiv has noted the early adoption of Seán (John), Tomás, William and Eamonn by Old Irish families from the middle of the thirteenth century onwards. (15) This in turn was followed, especially in the zones of greatest regaelicisation, by a powerful resurgence from the late fourteenth century onwards of names such as Aed, Tadc, Donnchad, Diarmait and Conchobar and a less powerful but sharp revival of names such as Aengus and Fergal and even an archaic name like Cairpre. However, as we have seen from the Tipperary hearth money records and the 1659 Census, the balance of power and fashion had swung decisively back to universal/European patterns of naming by the seventeenth century. Like in other West European countries, the use of Christian saints' names as first names in Ireland was a relatively slow process. Names such as Caemgen (Kevin) were not very popular and many of the ‘Máel’-type names (meaning ‘shorn, bald’) are not religious names per se . Colum and Pátraic are five times as popular after 920 as before while names like Máel Pátraic and Máel Ciaráin are both weakly expressed from 820 onwards. In contrast Máel Brigte is more than twice as often recorded in the AU before 920 than after while Máel Sechnaill undergoes a major blossoming from 820 on, strengthening further after 920. Máel Muire is twice as popular after 970 than in preceding periods while Máel Petair is weakly recorded after 920. Máel Coluim is five times more popular after 970 than before as is Máel lsu. The great series of ‘Gilla (meaning ’servant') plus a saint's name', headed by Gilla Pátraic and including Gilla Brigte, Gilla Caemgen, Gilla Coluim, Gilla Chríst, Gilla Mo-cholmóc and Gilla Muire only emerge powerfully after 970. There is no doubt but that the eleventh century is the key century for the florescence of this ‘Gilla’ naming tradition and represents a peak in the use of Christian saints' names as first names in a Gaelic form. Subsequently ‘Mac Giolla’ linked to a specific saint's name was to constitute at least 50 new surname forms. However, after c.1200 it is the Anglo-Norman conquest and settlement which adds—as in Norman England—most dramatically to the corpus of Christian first names in Ireland, perhaps adding a further 180 such first names to the Irish mosaic. Mac Lysaght has provided one measure of these transformations in first names from his analysis of sources such as the Civil Survey, the Books of Survey and Distribution and the Cromwellian Certificates. In the mid-seventeenth century, John was the most popular male first name, accounting for approximately 9% of the sample. Thomas, William, James and Edmund followed, each accounting for about five percent. The break with the earlier medieval period (up to 1169) is, therefore, quite sharp. The old Gaelic names Connor, Dermot, Donough, Rory and Teig, only occupy a third category, each accounting in turn for nearly three percent of the Catholic population. (16) Equally popular were Hugh or Ee (Aedh) and Daniell (or Donell). A little less prolific were Patrick, Richard and Nicholas. There follows Maurice, Edmund and Robert which were each about equal to the Gaelic Brian and Murrough. Mac Lysaght concludes that the list of these first names which each reach at least one per cent of the total includes Andrew, Christopher, Francis, Garrett, Henry, Loughlin, Mahon, Peter, Piers and Terlagh. These figures suggest a ratio of at least two-to-one by the mid-seventeenth century in favour of the Anglo-Norman derived first names for men as against the older Gaelic forms. The enumerated tituladoes of the 1659 Census allows some regional breakdown of this island-wide pattern. Amongst the enumerated old Irish gentry for Ulster, Donall and Patrick come joint-second to John, while Hugh, Phelim, Connor, Brian, Terlagh, Cahir, Rory and Niall are also strongly represented. In fact of the top ten first names of the old Gaelic elites of Ulster seven were from the Gaelic tradition and only three (John, Edmund and Thomas) from the medieval. In contrast, amongst the Irish gentry of Connaught only Bryen and Patrick figure in the top ten with John and Thomas dominant with 9% each of the total followed by William, Edmund, Nicholas, Robert and Richard. The situation was very different amongst the new settler gentry of Ulster. John (21.3%) remains the dominant first name followed strongly by William (11.9%), James (10.5%), Robert (8.0%) and Thomas (7.0%). Richard, George, Henry, the striking name Alexander (Alasdair) and equally fashionable Irish/Scottish/Gaelic name of Hugh complete the ten most popular names and together constitute a further 20%. Apart from Hugh, Thomas and the ever popular John, no other first name is shared with the top ten names of the old Irish gentry while names such as Archbald, Arthur, Charles, Cromwell, Gustavus, Jason, Jacob and Joshua, through to Samuel, Theophilius and Tobias bespeak the new political and religious order. Below the gentry level, a sample inspection of settler names amongst the 1641 depositions from the counties of Armagh, Queen's County (Laois) and Waterford shows that seven first names accounted for almost two-thirds of the total record. (17) John leads with 21%, followed by Thomas (12%) and William (10%) and the following four names—Richard, James, Henry and Robert—combine to make a further 20%. A further twelve names, headed by Nicholas and concluded by David add a further 18%. The remainder, which occur four times or less include such wonderful names as Isaak, Jasper, Job, Marmaduke, Rowland, Tristan and Zelopheled. At the urban settler level, very little difference is to be noted. For example in Cork City John and Thomas lead the way followed by Richard and William with George, Edmund and James and Robert also very popular amongst the new urban elite. The 1659 Census has little to tell us about incoming women's first names. Only South-West Cork yields a sample of its secrets with Mary (6), Anne (6) and Elizabeth (4) the most popular with names such as Sophia, Hester, Abigail, Charity, Susan and Grace also represented. The 1641 depositions—given the much greater sample of women's names—is a much more fruitful source. These depositions comprise, for the most part, the sworn statements of Protestant settlers who had endured the Irish Rising of 1641-42. Again taking the women settlers from County Armagh, Queen's County and Waterford, Elizabeth is the clear first with 21% followed by Margaret (11%), Mary (10%), Ann(e) (9%), Jane (8%), Joanne (7.6%) and Alice (6.5%). Katherine and Ellinor score at 5% while Dorothy, Ellen, Grace and Isabel are each returned 2-3% of the time. Names such as Charity, Eliza, Judith, Madeleine and Joyce speak to new cultural impulses, as both the reality and perception of ‘Protestant’ Christian names as opposed to ‘Catholic’ forms takes deep root. The hearth money records for Co. Tipperary offers a contrasting picture of women's first names amongst both the Old Irish and the descendants of the Anglo-Normans. The leading name by far is Margaret (23.5%) followed by Joan (12.8%), Katherine (10.5%) and Ellen (9.0%) with Mary and Honor joint fifth. Eilís, More (Mór), Sheila (Síle) and Ellinor complete the top ten first names for women. Elizabeth, first among settler names, is joint-twelfth with the strong ancient Irish name úna. 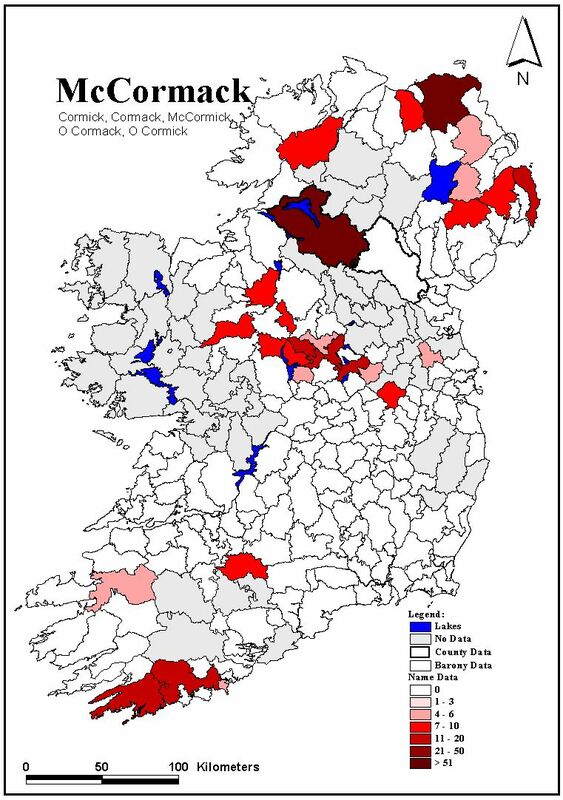 And within Co. Tipperary the Gaelic first names such as Mór, Síle and úna are more strongly represented in North-West Tipperary amongst key families such as the O'Kennedys, Gleesons, Ryans and O'Dwyers. The pattern of pre-planter first names amongst the women of mid-seventeenth century Co. Dublin, while very similar to Tipperary, does reveal subtle regional differences as well. (18) Margaret still heads the list but is followed strongly by Katherine. Mary (third) is in a much stronger position. Elizabeth is also more fashionable as are Anastasia and Sarah. Distinctive Pale first names include Rose, Marie, Dorothy and Alison. There are very few Gaelic first names left amongst the women of South Co. Dublin. Owney (the anglicised version of úna) occurs; Brigid is rare while Finola also makes an appearance. By 1652, the universal saints' names brought in in the medieval period are dominant in the Pale and the old Gaelic first names have been eroded dramatically from this symbolic landscape. The devotional revolution and the resurgence of the Catholic Church combined with another great Gaelic revival phase which gathered power in the later nineteenth century and had peaked by the mid twentieth century has resulted in a whole range of both saints' names and old Irish first names being resurrected: Christopher and Martin are striking additions amongst the men and a new blossoming of names such as Aoife, Fiona, Gormlaith, Nuala, Orla, Sheila, Sineád and úna has taken place amongst women's first names. Such names transcend the later Middle Ages to reach back to the most fashionable women's names in the pre-Norman period. The name Mary—already quite strong in the Pale region of the seventeenth century—now becomes the most favoured woman's first name. The depth of the cultural divergence between such women's first names as revealed in the mid-seventeenth century data sources and those of the mid-twentieth century is indeed immense. A vast journey over a complex cultural terrain has been negotiated and traversed over the intervening three centuries. However great continuities also prevailed—and the most enduring feature of the Irish fashion in naming is the continued use of the forename in the creation of the very distinctive Irish second or surname system. And when we map the surnames from the 1659 Census, the great and most geographically extensive names—the Cormacks/McCormacks, the Connors/O'Connors, the Donnells/O'Donnells, Dermots and McDermots and the Donoghs/McDonoghs—echo back across the centuries to some of the key first names (Figure 4). In the 1992 specially revised edition of Woulfe's Sloinnte Gaedheal is Gall—Irish names and surnames , the Irish Genealogical Foundation provide a new index which lists c.11,500 Irish surnames in their English-language forms. (21) This list both reflects the Americanisation as well as the anglicisation of Irish name forms and takes into account the multiple renderings of the c.3700 surnames documented by Woulfe in their original Irish language versions. And close on one in seven of the names discussed by Woulfe are themselves diminutives or variations of other primary family surname forms. Irish surnames, therefore, are diverse in number and form and the linguistic heritage of English/British colonisation means that most surnames—like the placenames—have at the very minimum two forms—one in Irish and one in English. A name like Mac Con Aonaigh ("son of the hound/warrior of the fair") ended up by the late nineteenth century as McEnanny, McNeany, McAneany, MacAneeny, MacAneny, MacEneany, MacNeney, MacNeany, Conheeny, Cunneeny and twenty-seven other versions including being (mis)translated as ‘Bird’ in Ulster and ‘Rabbitt’ in Connaught. (22) The Atlas story of modern Irish surnames is therefore a story of diversities, pluralities, multiplicities, ambiguities, fluidities—a story of the wearing of many masks and the use of many forms of dress and address. Correlating early surname formation with occupational details highlights the significance of at least two specific groups with powerful interests in the hereditary principle. Royal families, other aristocratic families and local lords intent on carving out distinctive territorial domains, symbolised their status and distinctiveness by the adoption of specific surnames. They drew both a symbolic and geographical boundary around themselves as members of the ruling landed elites, thus forcing the discarded segments to adopt other name formations. It is also relevant to note that early surname formation did become a feature of the key kin-groups attached to royal and aristocratic households and military administrations including castellans, stewards, brehons, bards, as well as military officers on land or sea. Equally significant was the formation of early surnames amongst the ecclesiastical elites. Ireland appears to be unique in Western Europe in that clerical families developed their own genealogies (in addition to compiling and preserving the secular genealogies), thus stressing the centrality of the hereditary principle amongst the mainly aristocratic church families. One of the earliest and most powerful groups to develop second permanent names were the erenagh families—these deeply rooted custodians of church/monastic lands, many of which survived in the same parishes down to the nineteenth century. Lectors, abbots and bishops also made their contribution to the stock of surnames as did other related elites such as the poets, historians and topographers. An acceleration in both occupational specialisation and occupational diversification after 1020 and especially after 1070 also added impetus to the solidification of distinctive surnames (see Appendices). At the time of the Nordic invasions, hereditary surnames were not as yet in vogue in Ireland; but did these Northerners also help to propagate the ‘Mac’ surname form in Ireland? The distribution of the Scandinavian-Irish name—MacOtair (Cotter)—is illustrated in the Atlas Abstract as is MacSweeney. Certainly their Norman cousins helped to strengthen this process after 1169 and confirm that by the mid-twelfth century Irish surname formation was almost invariably taking the ‘Mac’ form. Many Norman families assumed surnames of a Gaelic form such as Mac Gerailt and Mac Uigilin. Mac Lysaght observes that the majority of these such as Mac Sherone ex Prendergast and Mac Ruddery ex Fitzsimon are nearly extinct today as are various offshoots of the Burkes. (27) Yet subsepts of the Burkes survive as Mac David, Mac Philibin, Mac Gibbon, and Mac Redmond. Likewise, as Mac Lysaght notes, the Bermingham name often survives in the form of Mac Corish or Corish, the Stauntons came to wear the mask of Mac Evilly, the Archdeacons that of Mac Oda or Cody while the Nangles are rendered as Costello (and in the past as Mac Costello). (28) Woulfe has argued that the Nangles were the first Normans to adopt the ‘Mac’ form as early as the late twelfth century. (29) Subsequently quite a number of Norman families assumed surnames of a Gaelic type and formed septs or subsepts on the Gaelic model. Others were to perpetuate the ‘fils/Fitz’ form as demonstrated in the Atlas Abstract for Fitzgerald. In addition Mac Lysaght has identified over 80 Anglo-Norman surnames which were formed from trades, employments, personal characteristics and nationality and are represented in medieval Irish records. These include Archer, Carpenter, Draper, Ferriter, Fleming, Skinner, Tanner and Woodman. Butler is another name of this type and its changing distribution between c.1659 and c.1850 is shown in the Atlas Abstract (Section VI online). By 1500, Gaelic and Gaelicised Ireland was still an expansive confident world and both the Irish language and Irish surname forms predominated in such regions. English speech and English name forms were then concentrated on the enclave of the Pale and Dublin, a few other key port-cities and regional pockets elsewhere. By the early eighteenth century, in contrast, the tide had turned dramatically in favour of the English language and British culture and in favour of anglicised surname forms. The Tudor, Cromwellian and Williamite conquests had oppressed Gaelic Ireland and the story of the beginnings of a linguistic conquest is chronicled with ever increasing geographical precision between the 1530s and the 1660s in a large number of documents written in English. These begin with the fiants of Henry VIII and of Elizabeth which provide in extraordinary detail the name forms of many in the Irish population over the sixteenth century. (30) The data on first names and surnames grows stronger in the seventeenth century via sources such as the 1641 Depositions and the hearth money records and culminate in the key source for this paper—the 1659 Census. The increasingly detailed manuscript maps of sixteenth and seventeenth century Ireland likewise rendered key Irish family names and their territories in English forms as the rechristening of people and landscapes gathered pace. Recognition of the significance of these English-language based sources signals that the power to narrate Ireland's story and its naming systems had shifted dramatically by the seventeenth century. There are then the great regional names, confined to a single province and usually occupying two or three adjacent counties. The O'Sullivans and MacCarthys in Southwest Munster and the O'Dohertys and Gallaghers of Northwest Ulster are examples in this category which comprises a further 12% of the ‘1659’ total. 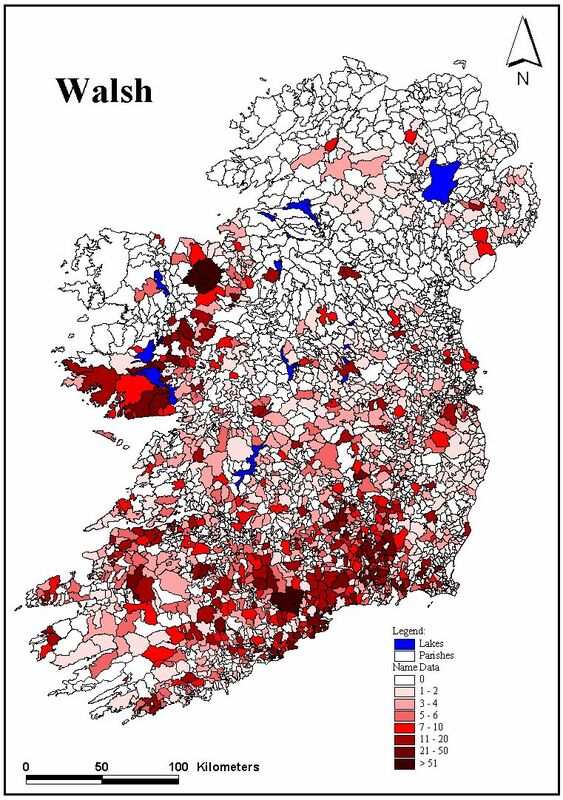 Close on one third of the mapped surnames are located over two or three provinces—names such as Butler, Dillon, Dalton, Fitzpatrick, Fitzgerald, Gormley, Fahey, Fallon, Donnelly, Doyle, Cantwell, Crotty, Cullen, Egan, Healy, O'Hara, O'Rourke, O'Toole and Russell. Finally we come to the ‘universal’ names found in all four provinces—including such names as Brennan, (O) Brien, Daly Kearney, Moore, and Smith as well as other great patronymic family names such as O'Connor, O'Kelly and Martin already discussed in Part I (see Figure 4). And as early as 1659 not only the anglicisation but also the fragmentation of Irish surname forms was well on its way. Three surnames—that of Fitzmorris, O'Brien and Morrogh/Murphy—are each rendered in at least twelve different ways in the Census. A further 19 names—from Byrne and Clarke, through Curran and Nolan to Ryan and O'Sullivan—are all rendered in at least eight, and often up to eleven, variations. A further 41 names from Duffy and Brennan onto Crowley and McDonagh are rendered in five to seven ways, while an additional 24 names including Brannagh and Cahill, O'Riordan and O'Rourke, are returned in at least four variant forms. The splintering of Irish cultural and political formations is symbolised in the fracturing of its surname forms as is internal differentiation in naming patterns within one linguistic community. The ‘1659 Census’ also allows us to map the precise distribution of English and Scottish settler names in the mid-seventeenth century. We are still not fully certain how Petty managed to instruct his clerks to make the crucial ethnic classification which allowed them to distinguish between the ‘English’ (and Scots) surnames and those of the ‘Irish’. The likely process is that Petty's clerks—under the strict supervision of Petty's two most loyal and efficient lieutenants, his cousin John Pettie and the tireless assistant Thomas Taylor—were instructed to abstract and add up the total of Irish family names townland by townland from the parish poll-tax lists. (32) The easiest way to calculate the number of English and Scots was to subtract the Irish totals from the total number of tax payers enumerated for each townland, parish and barony. Alternatively, the clerks were instructed to identify the settlers by their distinctive family names. The evidence for Co. Fermanagh suggests the latter strategy since, alone for this county, not only are the principal Irish names of specific districts named but so are the principal Scots and English and their number. As it happens the Armstrongs head the list with 47 adults, the Johnstons follow with 34, the Elliots 28, the Grahams 21, the Nixons 14 while the Catcharts, Belfores, Croziers, Irwins, Montgomerys, Nobles and Scotts each recorded from five to ten adults. It is also clear that Co. Down and particularly Co. Antrim presented special problems to the clerks in distinguishing between the local Irish, Scots-Gaelic settlers and other planters with Mac prefixes. Nevertheless, the picture portrayed in Figure 5 is as reliable a guide as we are ever likely to get of the relative distribution of English/Scots vis-à-vis the Irish for the mid-seventeenth century. 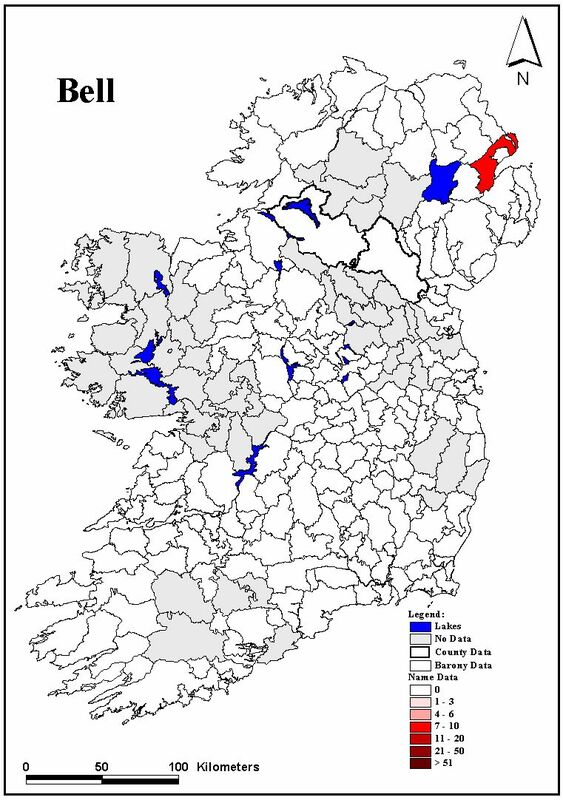 Figure 5 summarises at the barony scale the level of immigrant penetration in Antrim, most of Down, North Armagh, much of the county of Londonderry, East Donegal and a core around the lakes of Fermanagh. Key settler names included Smith, Brown, Murray, Wilson, Clarke, Johnston, Thompson, Robinson, Reid and Graham. This map illuminates the cutting edge of a south-westward frontier as it advanced into the less densely populated edges of Connaught and the northwest midlands generally. This advancing front of settler names was marching against an existing Gaelic world and in this encounter some of the older populations were deflected further south into Omeath in the Cooley peninsula to the east and the Galway-Clare borderlands and islands in the west. Key settler names Bell and Campbell are included in the Atlas Abstract (Section VI online). The second most powerful core of planter surnames pivoted around the Pale region and Dublin City. Apart from a strategic northern salient, planter family names are only weakly represented in the rich hearthlands of North Leinster. But to the south and west a new wide band of significant minorities bearing planter names stretched right across Laois, Offaly and the edges of North Tipperary to reach the Shannon and Limerick. On the other flank, these settler names curved southwards to colonise the West Wicklow-North Wexford borderlands. Thirdly, there was a southwestern core of planter names pivoting around Cork City and the Munster plantation precincts. Beyond these three cores, old Irish family names predominated. The 1641 Depositions and particularly the far greater survival rate of records of the hearth monies for many of the Ulster counties provide further insights into the distribution and character of settler names as they were carried into the northern half of Ireland. Philip Robinson has made a major contribution here with his impressive maps of Scottish and English settlement zones based, amongst other criteria, on surnames analysis. (33) Bill Macaffee has also done important work here especially for the Maghera region (34) while Brian Turner and the late Brendan Adams have furthered our understanding of what they term the surname landscapes of Fermanagh and Leitrim. (35) Further south it has likewise been possible to pinpoint the spread of English settlers in Tipperary using its hearth money records. As in Ulster, one notes the key role of the towns as gathering points and as springboards for funnelling settlers into the countryside. This surname analysis allows us to track these families and individuals as they spread out along the existing roads into the villages, farms, castles and big houses. And these detailed seventeenth-century surname distributions also indicate the fissures along which the English language spread at the expense of Irish. Along these linguistic interfaces, compromises, confusions, ambiguities and pluralities abounded. My own name Smyth/Smith (it has already splintered!) is the commonest surname in England and the fifth most common name in Ireland (see Atlas Abstract of Smith distribution for both c.1659 and c.1850). As Mac Lysaght explains some of the Smiths are descendants of settlers and traders but equally probably at least 80% of the Smiths of Cavan are of the stock of Mac Gowans or Gowans who, under pressure of alien legislation and/or social influence accepted the translated form and used it ever since. (36) And where I come from in North Tipperary, the ancestors of the present day Smiths are remembered in the mid-seventeenth century hearth money records as the ‘Macingownes’. Yet a brief survey of the Fiants of the second half of the sixteenth century shows that both Gaelic Christian names and surnames were still rendered in their older forms. The seventeenth century is absolutely decisive for the transformation and anglicisation of surnames. As Mac Lysaght notes, this was the period during which our surnames assumed approximately the forms ordinarily in use in Ireland today. (37) The seventeenth century, thus, marks the great divide between late medieval and modern Ireland and its surnaming systems. The names of the Elizabethan settlers and their more numerous successors in the seventeenth century did not become Gaelicised while the surnames of the Irish—whether of Gaelic or Anglo-Norman ancestry—were often transformed beyond recognition. In a sense, just as the mapping and renaming of their lands by the imperial power seemed to both appropriate the landscape and distance them from it, so the anglicisation of their name forms was another form of alienation and othering. Clearly the symbolic universe of the Irish was being both fractured and reorganised. In addition, Mac Lysaght has identified at least 255 surnames which are indigenous and common in Britain which come to be used as the anglicized form of Gaelic Irish names. These include, for example, Adrian for the Irish O'Dreane, Badger for Brick, Bird for MacAneany, Crosbie for MacCrossan, Duck for Lohan, Ingoldsby for Gallogley, Moleyneux for Mulligan, Rogers for MacRory, Ryder for Markahan and Woods for MacElhoyle and Kielty. Likewise, he identifies over 70 Gaelic Irish surnames which have an English appearance but nevertheless are rarely if ever derived from Britain. These include Atkins, Blowick, Cheasty, Durack, Flatly, Kneafsey, Prunty, Swords and Zorkin. To confuse matters further, there are about forty Gaelic Irish names such as Brazil, Hession, Kehoe and Mannix that look like they are of foreign origin but are rarely if ever found as native to any country but Ireland. (38) There is also a large class of Irish surnames, anglicized in a way which makes them unrecognizable. Such ‘distortions’, as Mac Lysaght notes, turn Mac Giolla Bride into Mucklebreed and Mac Oireachtaigh into Gerty. And no one would readily recognize that (Mac) Lysaght has its origins in Mac Giolla Iasachta or that Mac Aleese was originally Mac Giolla losa. It is doubtful if any other West European country has witnessed such a variety of transformations in surname forms. (Mis)translations, abbreviations, elisions, excisions, misunderstandings abound, a process accelerated further with the exodus to America. By 1890, the mutation and diversification of these names over the previous two centuries becomes clearer. In his survey of that year, Matheson identified close on 8000 surname variations out of a basic stock of over 2000 root names. (39) On average, therefore, the Registrar General recorded nearly four variations to any one single family name. At least a quarter of Matheson's registered surnames showed at least five variations in form and as many as one out of every six name forms shows ten or more variations. The name McLaughlin contains eighteen forms as does Cullen. McGuinness and Cunningham exhibit over 20 forms as do McDermot and Bermingham. Connolly, (O)Connor(s) and (O)Byrne reveal over 25 variations in name form while as we have seen, MacAneany is rendered in at least 38 different ways. The shattering of the Irish surname structures says much about the confusions that prevailed after the military, political and eventually the linguistic conquest of English/British forces. 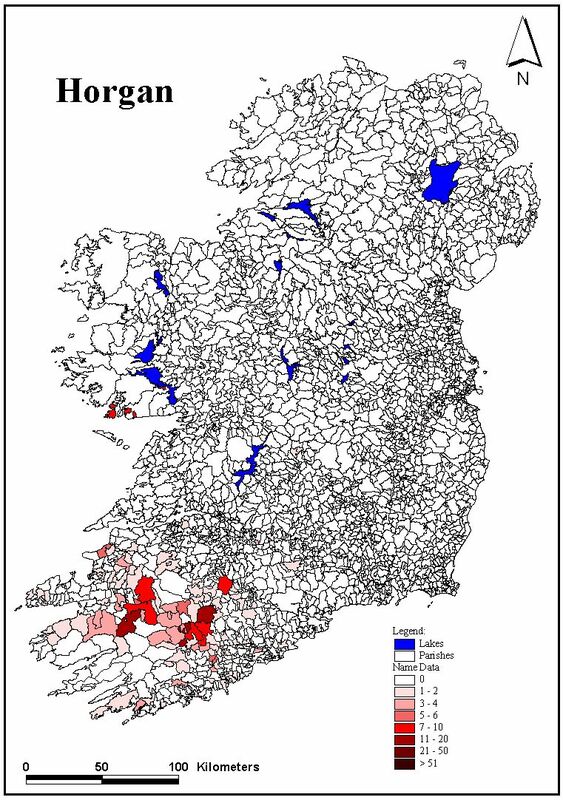 The quite extraordinary proliferation, multiplication and diversification of single surname forms also points to local and regional styles of both Irish and Hiberno-English pronunciation in the eighteenth and nineteenth centuries. The geographical story of this anglicisation of Irish surnames is therefore a story of complex, multiple and mobile forms which shift and shuffle across a variety of local and regional terrains. The regaelicisation of many Irish surname forms since the 1880s has been equally a complex business. The geographical stories associated with the ‘O’ and ‘Mac’ forms provides one window on all these processes. The ‘1659’ list of principal Irish family names is of immense value in reconstructing both the late medieval attrition of the ‘O’ and ‘Mac’ in family surnames by the mid-seventeenth century as well as providing an essential benchmark for an analysis of the later processes of regaelicisation and regional expressions of such processes as surname renaissance and symbolic decolonisation. 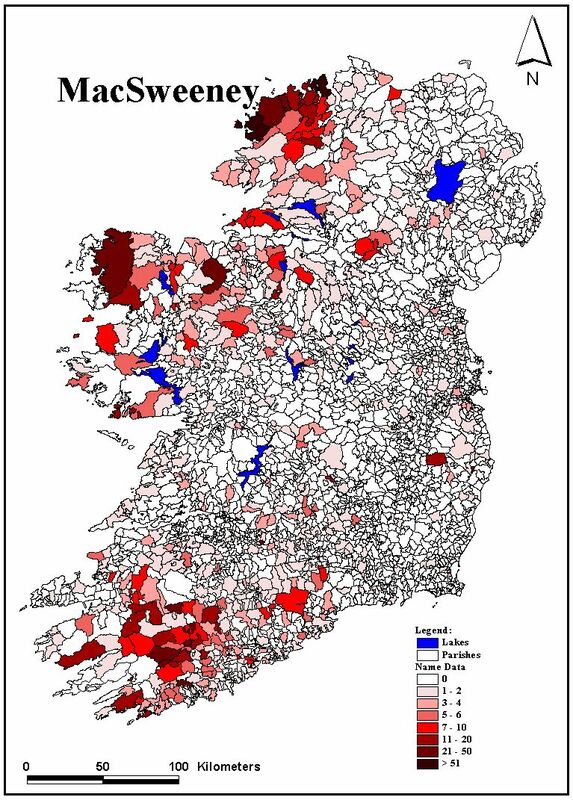 Figure 6 outlines regional variations in the percentage of the principal Irish family names which displayed neither an ‘O’ nor a ‘Mac’ form in the mid-seventeenth century. One has to allow that Irish family names in the 1659 enumeration includes a number of Old English names that had not been gaelicised. This therefore affects the distribution pattern especially in Leinster. Nevertheless, one can clearly identify four cultural regions. Much of Leinster with a core in the Pale which expands westwards into the Midlands and southwards down the Barrow valley to Waterford is seen to be a strongly anglicised zone. In this region, powerful pressures linked to the Anglo-Norman colonisation, the deliberate propagation of the English language as a general policy dating back to legislation such as that of 1465 which required every Irishman living within the Pale to take an English second name (40) all whittled back the distribution of ‘O’ and ‘Mac’ names. The impact of the early Laois-Offaly and Wicklow/Wexford plantations is already evident by the mid-seventeenth century, accelerating this pattern of name modification and transformation. As with the Christian names, a sharp linguistic and cultural frontier is reproduced along the Leinster/Ulster borderlands. The second major cultural region expands from this Northern frontier zone into north-west Leinster and east Connaught and stretches south through East Clare and much of Tipperary and Waterford towards an outlet in South-west Cork. This is the great hybrid cultural region which emerges on a number of maps of this late medieval world. Here, powerful cultural influences from both gaelicising and anglicising forces met, clashed and fused. By the mid-seventeenth century, however, the cultural and linguistic balance—as evidenced by the 50 to 70% attrition of ‘O’ and ‘Mac’ name forms—had already swung in favour of an anglicising model. Parts of counties Galway and Mayo may have also belonged to this transitional/hybrid cultural region but it is more likely that they showed many of the characteristics of Clare which displays a complicated mosaic of naming adaptations. And South-west Clare points the way towards the third major cultural region, comprising most of South and West Munster. Indeed a relatively sharp frontier extends from mid Clare into the hills of Tipperary and extends southwards into the West Waterford coastlands. South and west of this line a far greater resistance to the anglicisation of surnames is revealed for the mid-seventeenth century. A much more intact Gaelic linguistic and naming structure is suggested here with significant local core areas of strength in both the East Cork and the North Kerry/Limerick hearthlands. Ulster is again the most outstanding cultural region in its stubborn retention of its ‘O’ and ‘Mac’ name forms. Over much of this Northern province—from Lecale in Co. Down to the peninsulas of Donegal—less than 5% of the principal Irish names have lost the ‘O’ or ‘Mac’ forms. 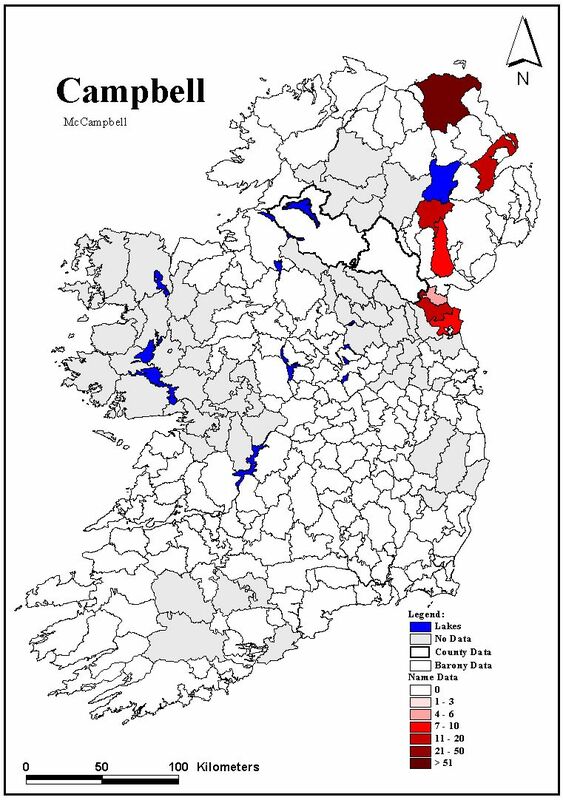 This region of great continuity extends over much of Co. Leitrim (and probably Co. Cavan) as well. And as seen with the regional variations in Gaelic first name patterns, South Ulster presents a very sharp frontier to the anglicising world of North Leinster. By the mid and late nineteenth century this picture is very different. Griffith's Valuation for the 1850s (41) and the Registrar General's survey of 1890 provide us with magnificently detailed sources as to national, regional and local patterns of naming. The processes of surname transformation in the intervening eighteenth century—the mistranslations, the admixture of forms, the attritions—needs much further study. For example Mac Lysaght notes that the great variety of very specific surnames as revealed in the Elphin diocesan survey of 1766 has been much reduced by the later nineteenth century. (42) A summary of the status of family names as rendered in the English language in the 1766 survey of Cloyne diocese provides other clues to the deepening of the anglicisation process by the mid eighteenth century and the forces undermining the ‘Os’ and ‘Macs’. 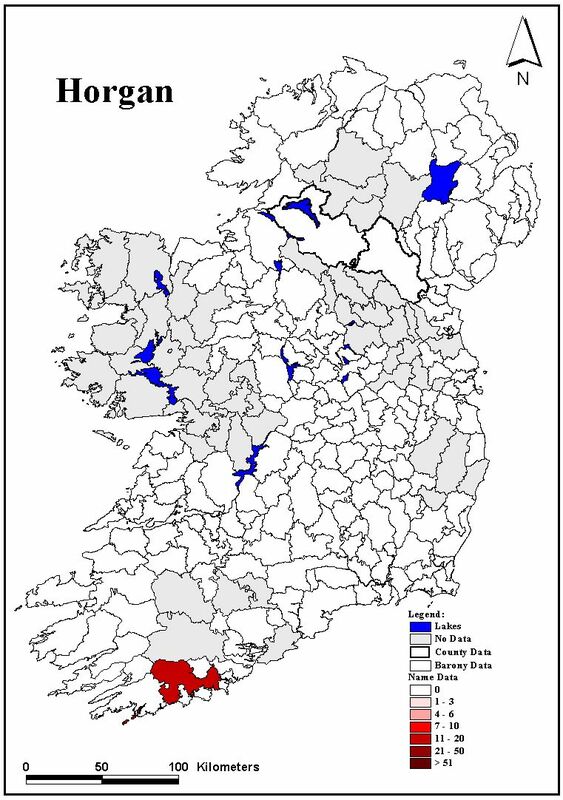 (43) Only three percent of ‘Irish Papist’ surnames for this region of North and East Cork are recorded (or transcribed) as retaining the ‘O’ and ‘Mac’ forms by 1766. The list of surviving ‘O’ and ‘Mac’ names is as follows: MacAuliffe 63, McCarthy 50, McGrath 48, McNamee 33, McDaniel 27, McDonnell 22, Maguire 8, O/McBrian 7, O'Callaghan 6, O'Connor 3. Five other ‘O’ or ‘Mac’ names are each recorded twice and eighteen other surnames retain the ‘O’ or ‘Mac’ form at least once. And one of the most telling statistics is that the MacCarthy surname form is outnumbered by three to one by the diminished ‘Cartie/Carthy’ form. The flattening and erosion of the Gaelic name forms appears to be astonishing. The cultural distance between the strong Gaelic naming patterns of North and East Cork as per Petty's 1659 data and that of 1766 is very sharp indeed. But equally sharp is the cultural distance experienced by 1890 when Matheson records that only 14% of the MacCarthy name is rendered in the abbreviated and impoverished ‘Carthy/Cartie’ forms. Even allowing for underenumeration by English speaking pastors of the MacCarthy forms in 1766 in what was still often an Irish-speaking area, it is clear that by the 1890s the regaelicisation of surname forms had ushered in a new era for both Cork and Ireland. Much research needs to be carried out on the specific timing of, and regional variations in, this regaelicisation drive as represented by the resumption of the ‘O’ and ‘Mac’ forms. What is clear is that its roots lie back in the mid nineteenth century, perhaps earlier. This generalisation is confirmed by a brief analysis of a small sample of three surnames that of the O'Neill/Neill, O'Connor/Conners and O'Regan/Regan—over the period between 1850 and 1890. An analysis of the O'Neill/Neill distributions c.1850 shows that islandwide 47% of these families rendered their name with the ‘O’ form. By 1890 this proportion had risen to 62.5%. The O'Connor percentage doubled from the 11% recorded in 1850 to 20.4% in 1890. The O'Regan name form had also doubled its ‘O’ component but from a very low base of 3.3% in 1850 to 6.5% in 1890. But this small sample also clearly reveals profound differences in the fortunes of different Irish family names over recent centuries. The O'Neill/Neill dialectic belongs to a small minority of five Irish surnames which in Matheson's 1890 survey have a greater than 50% retention of the ‘O’ form. Of the 312 O'Donnell/Donnell name forms, 94.2% retain the ‘O’ form—the most resilient therefore of the big aristocratic names. O'Hara/Hara (111 examples) likewise reveals either a striking stability or renaissance with 95.5% exhibiting this ‘O’ form. These are followed by O'Dea (77.7%) and O'Brien (67.1%). Of Matheson's total sample of Irish names, based on all births registered in 1890, four other family names score over 40% in their use of the ‘O’ form; the O'Gradys, the O'Keeffes, the O'Loughlins and the O'Shaughnessys. At the other end of the spectrum of families which retain the ‘O’ form—O'Boyle (6.8%), O'Byrne (1.08%), O'Doherty (1.9%), O'Donovan (5.0%), O'Driscoll (9.7%), O'Farrell (5.1%), O'Flynn (1.0%), O'Mahony (8.3%), O'Regan (6.8%), O'Reilly (9.6%) and O'Riordan (6.5%)—all fall below 10%. But the centuries old attrition was much greater and deeper than this. Only 10.8% of the family names identified by Matheson as originally characterised by an ‘O’ form actually retained this form by 1890. More dramatically, only c.3% of the potential family names as identified by Woulfe as beginning with ‘ó’ had survived into the late nineteenth century retaining their ‘O’ form. Mysteries abound. Why, for example, did ‘strong’ families like the (O) Kennedys of Thomond not display even one ‘O’ form in 1890? In some instances, there may be a Gaelic syntactic explanation. Clearly, this whole area requires much further research. Matheson's report also allows for broad regional generalisations to be made in relation to the retention or loss of ‘O’ and ‘Mac’ forms. Munster is the great stronghold of the ‘O’ forms (50%) with Ulster (20%) and Leinster (18.5%) very similar while Connaught retains only 11.2% of the total for Ireland as a whole. A percentage analysis of the ratio of ‘O’ forms to the total population born in each province in 1891 provides a somewhat more precise picture. Munster emerges as the most resilient and retentive of the ‘O’ form, followed by Leinster and Connaught in that order with Ulster somewhat weaker. However, if one were to analyse the name formations using religious affiliation as a control, Ulster's position in the league table would likely be enhanced. In this context perhaps the most dramatic reversal in the status of the provinces emerges when the retention/resilience of ‘Mac’ forms is scrutinised. Ulster is emphatically the core world of ‘Mac’ formations with 63% of the total surviving Mac forms in 1890 concentrated in the Northern province—a pattern which is even more emphatic in Gaelic Scotland. Munster and Connaught have very similar proportions with 13.3% and 13.7% respectively while Leinster is the weakest with 9.8%. And of the leading names with over 200 occurrences in 1890, only four are from the ‘O’ family—O'Connor, O'Donnell, O'Gara, O'Neill—while seven are ‘Mac’ names: MacCarthy, MacLaughlin, MacCormack, MacGrath, MacDonnell, MacMahon and MacKenna. These patterns are fascinating and may suggest the originating regions for the ‘O’ and ‘Mac’ forms. Did the ‘O’ form of family names originate in the south/southwest of Ireland? And is the ‘Mac’ form originally much more rooted in the northern half of the island? The strength of the Mac form in Ulster also strongly relates to the immigration of many Scots settlers into Ulster retaining the ‘Mac’ form. Examples include McBurney, McClelland, McKinney and McKinstry. 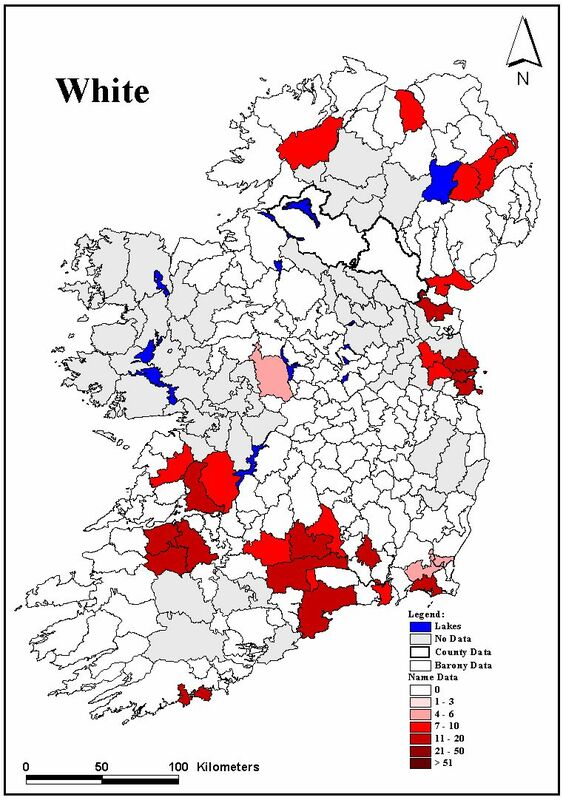 Likewise, given that the ‘Mac’ form had higher status in these settler regions there may not have been the same psychological pressure on the old Irish to drop or mask the ‘Mac’ form in such territories. There also remains the mystery of why certain ‘Mac’ names have a high retention rate while others display high levels of erosion. Taking a sample of the A to C ‘Mac’ names, MacAlister, McArdle, MacCawley/MacAuliffe, MacBride, MacCabe, MacCann, MacCartan and MacClean and McCloskey show no loss in the ‘Mac’ forms. In contrast the Bradys, Breens, Brennans, Cashins, Clancys and Coughlans had totally lost the ‘Mac’ form by 1890 and names such as MacCafferty and McCormack each show a 36% loss. Phonetic factors clearly enter the equation here but are insufficient explanations of heavy gains and losses amongst the ‘Os’ and ‘Macs’. One can attempt to summarise these local and regional variations in surname patterns by analysing barony by barony the dialectic between ‘O’ and ‘non-O’ forms in names such as (O)Neill, (O)Connor and (O)Regan from Griffith's Valuation. Figure 7 shows the ratio of ‘O'Neill’ surname forms in 1850 vis-à-vis the ‘Neill’ forms. The pattern in both may be reminiscent of the overall islandwide pattern of anglicisation and resistance to anglicisation as evidenced in the 1659 map (Figure 6) while also showing surprising new regional dimensions. 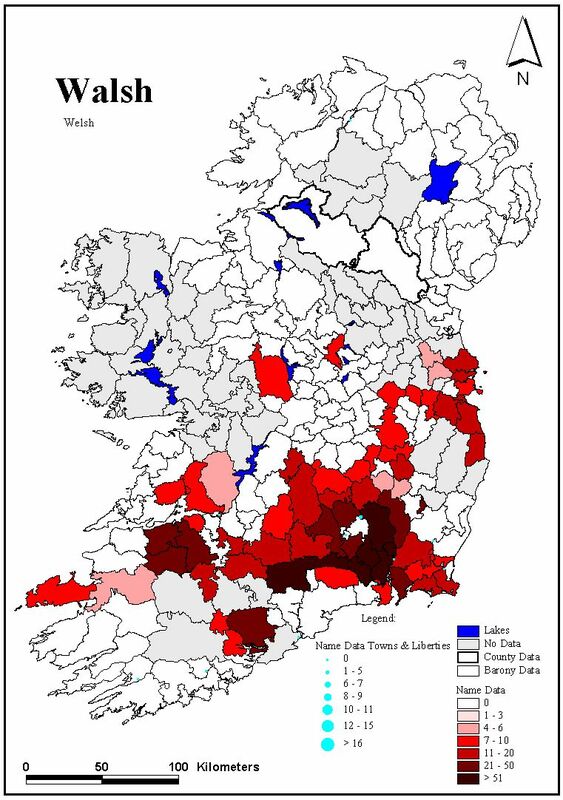 The settled Pale region of early English speech and the early loss of the ‘O’ form is revealed once again with an enlarged anglicised core spreading westwards from North Co. Dublin across the southern halves of Meath and Westmeath to cross the Shannon into South-East Galway. This core zone of anglicisation then extends southwards into East Tipperary and South Kilkenny and bends north along the western edge of Carlow and into Co. Wicklow. 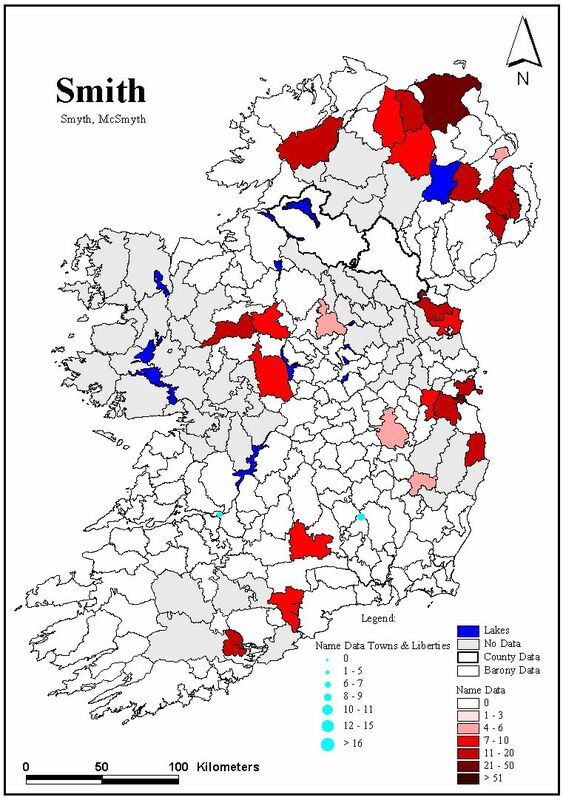 The second zone with high levels of anglicisation and the loss of the ‘O’ form includes practically all of the rest of Leinster and also includes much of North Tipperary, North-East Clare and East Galway. 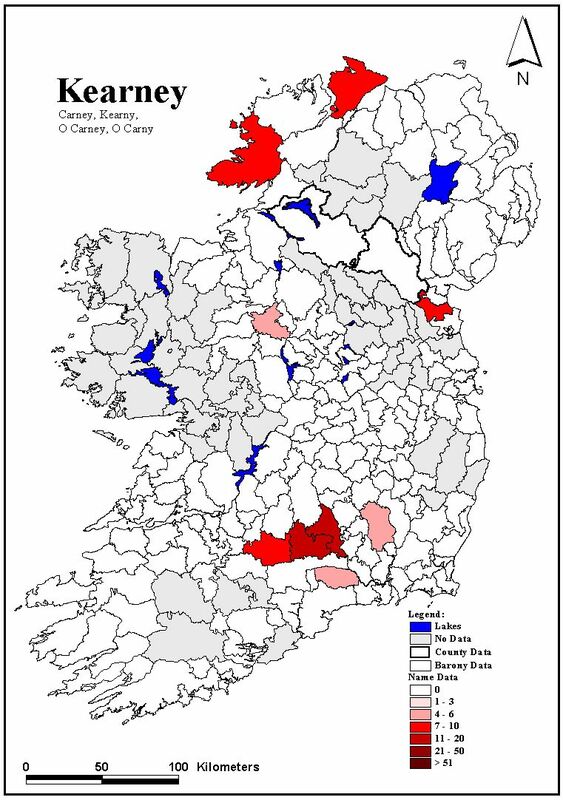 However, the most surprising addition to the zone of high ‘O’ losses in the O'Neill name are the old Gaelic strongholds of South-West Munster comprising West Limerick, Kerry and West Cork. Was the Munster plantation and the consequent early spread of English speech significant in this zone? Or does the ‘Neill’ form have deeper roots in this specific region? Already in 1660, the ‘Neill’ form is well entrenched from South Co. Dublin on to its core area of expression in mid-Carlow/Kilkenny and South Tipperary with outliers around Cork city and Islands barony in Co. Clare. In contrast, the great strongholds of ‘O'Neill’ surname renderings—where the ‘O’Neill' forms outnumbers the ‘Neill’ form by more than ten to one—are to the north and west, stretching from the Mourne-Dundalk and Glenarm/Antrim regions in the east on into the West Londonderry, Tyrone and East Donegal territories to the West. In addition, peak areas of O'Neill resilience emerges in the Carbury/Leyny section of Co. Sligo and the South Leitrim/North Longford zone to the south. Finally, another ‘O'Neill’ stronghold stretches from Ibrickan in the west to Bunratty in the centre of Clare. All these cores act as anchors to wider regions of continuity and resurgence over much of Ulster (apart from Cavan), along the northern and western edges of Leinster as well as comprising much of Connaught. Most of Thomond Clare falls into the pattern as does a strikingly wide belt of territory stretching from East Limerick through south and South-West Tipperary on into coastal Waterford. 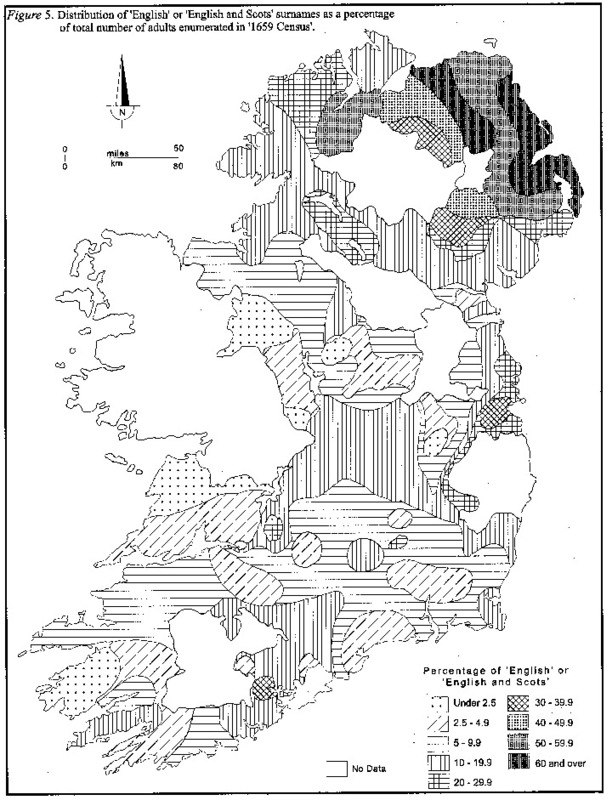 This latter Munster region appears to be a zone where the battle for supremacy between the Irish and English languages and cultures was prolonged. It may be no coincidence that this mid-Munster belt is also one of the great fulcrums of a series of agrarian, nationalist and Catholic movements from the mid-eighteenth century onwards and which in the twentieth century produced the Cooperative and Muintir na Tíre organisations. As we have seen the O'Connor name form lost out most emphatically to the Connor(s) form between the seventeenth and the nineteenth centuries. By 1850 only a few strongholds retaining the ‘O’ form persisted—one is the rather isolated region of the Déise of Waterford; a coastal zone from the Ibrickan to Corcomroe stands out in Clare while Kilconnell is in a striking outlier of O'Connors in Galway. 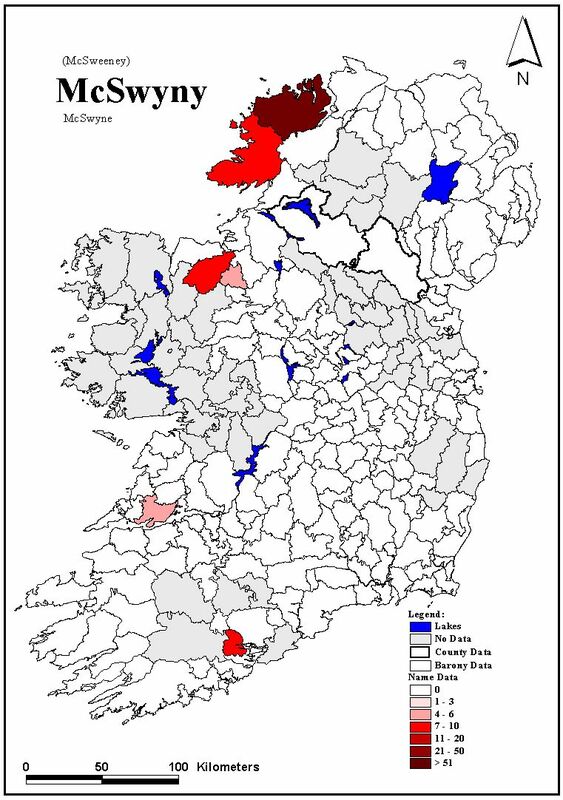 Sligo's baronies of Leyny and Corran act as the pivot of a strong zone of survival of the ‘O’ form in the North-West with local cores in Tullyhaw in Cavan and Tirhugh in South Donegal. 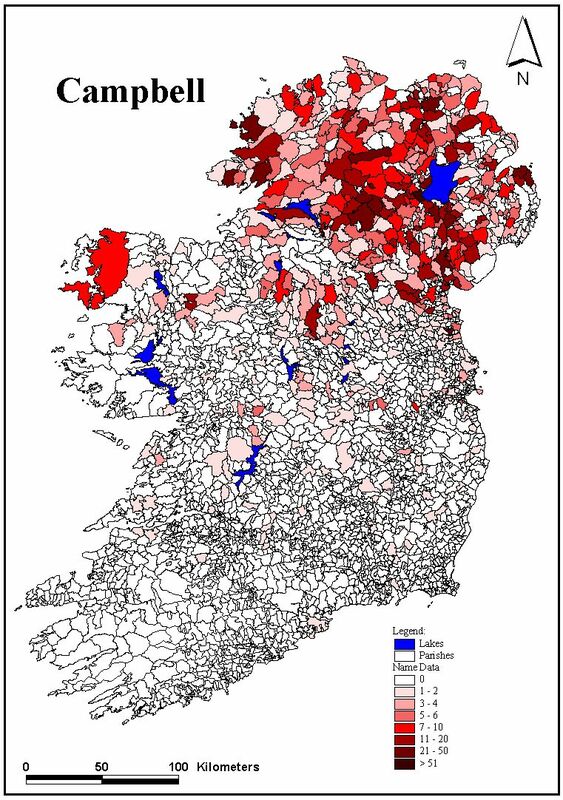 Weaker resilient regions exist from Dunluce Lower in Antrim and Morgallion in Co. Meath. Otherwise, the Connor(s) forms reign supreme and most emphatically over most of Ulster and much of Leinster apart from a cluster of baronies in Meath and Dublin. Excluding Gaelic Clare and Waterford, the O'Connor form is very weak over the rest of Munster although, once again, the band of country between Limerick city south to Cork city shows a stronger inclination in the use of the ‘O’ form. 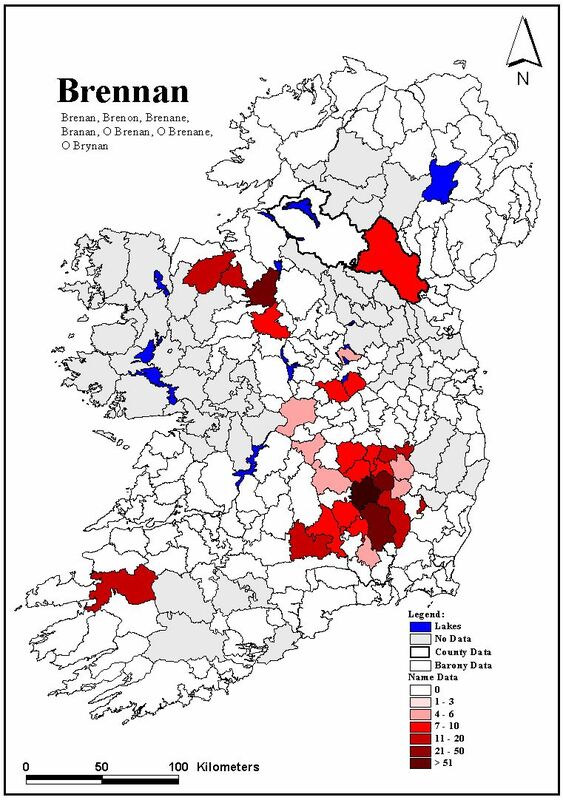 Cork and Limerick counties are also the only regions where the ‘O'Regan’ name form is represented in 1850; elsewhere the ‘Regan’ form is absolutely dominant. Matheson does not allow for a city/county analysis of this shift but the late twentieth century telephone directories do. (46) By 1990—a century after Matheson's report—the resumption of the ‘O’ and ‘Mac’ forms is both dramatic and still geographically instructive. In Cork City in 1990 only 0.8% of the O'Connor families still used the Connor(s) form. The equivalent figure for Dublin City is 6.7% while the Connor(s) form is stronger in Waterford City with 16.1%. Limerick City is emphatic in its assumption of the ‘O’ for with only 0.6% (or one household) retaining the Connor(s) form. The equivalent figure for Galway City is 3.7% while Sligo, an old O'Connor stronghold, reveals a 100% use of the ‘O’ form. As we move into the Ulster/Leinster borderlands Dundalk shows a 16.6% use of the Connors form. Derry City shows a stronger shift towards this form with 34.1% while in the Belfast City region nearly one-half (45.0%) still retain the Connors form. The O'Regan/Regan dialectic reveals similar patterns with striking regional variations from its Cork core where 89% are rendered as O'Regan by the year 2000 while in the northern half of the island less than 20% have yet assumed the ‘O’ form. Thus, in contrast to the attrition of the seventeenth and eighteenth centuries, the ‘regaelicisation’ of Irish surnames has been a feature of Irish life since at least the 1850s. More and more families asserted their familial and national identity by resuming the use of ‘O’ and ‘Mac’. For example, in Griffith's Valuation less than 2% of the O'Sullivans rendered their name with an ‘O’. By Matheson's survey in 1890 14% of the O'Sullivans used the O' form. By 1914 only 21% of the O'Sullivans had assumed the ‘O’ form. This figure had trebled to 60% by 1944 (47) and at the beginning of the twenty-first century over 80% of the O'Sullivans render their name in this way. Similar trends are revealed by the O'Regan surname which has increased from 6.9% in 1890 to 60% today. The widely dispersed name of O'Connor(s) is most geographically illuminating in this context. It is clear that the highest number of early adopters of the ‘O’ form amongst the O'Connors resided in the port cities of the South, and their adjacent hinterlands. Limerick, Cork and Dublin citizens—in that order—led in this renaming process. Rural areas generally were slower in adopting these changes, with the north-western counties showing lower patterns in the use of the O'Connor form. And by far the slowest rate of this form of regaelicisation in the island has been experienced in Northern Ireland where a majority still use the Connor(s) form. One of the great but not unexpected ironies, therefore, in the regaelicisation process has been that the core regions of anglicisation and the declassing of Gaelic forms of dress and address (including first and second names) have been the focal points of the modern Gaelic revival. 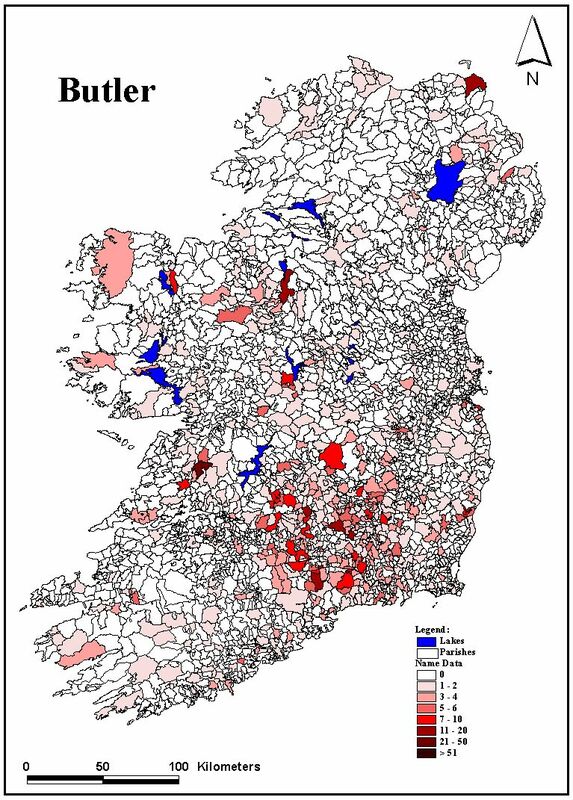 (48) The southern cities and their hinterlands have led the change, especially those of Limerick and Cork in Munster followed by Dublin in Leinster. Equally ironic is the fact that the north-western counties—so stubborn and so retentive of older forms up until the nineteenth century—have been slower to adapt the ‘O’ form. And the final irony is that Ulster and more particularly the counties within Northern Ireland—the region of greatest continuity and resilience in the seventeenth century—has the lowest rate of regaelicisation of surnames in the whole island. In many respects one could argue that the acceleration of the regaelicisation process—which was initiated by the nationalising middle classes of Cork, Limerick and Dublin and adjacent counties and towns from the 1850s and especially from the 1880s onwards—has only taken off in the North of Ireland since ‘the troubles’ of the late 1960s. 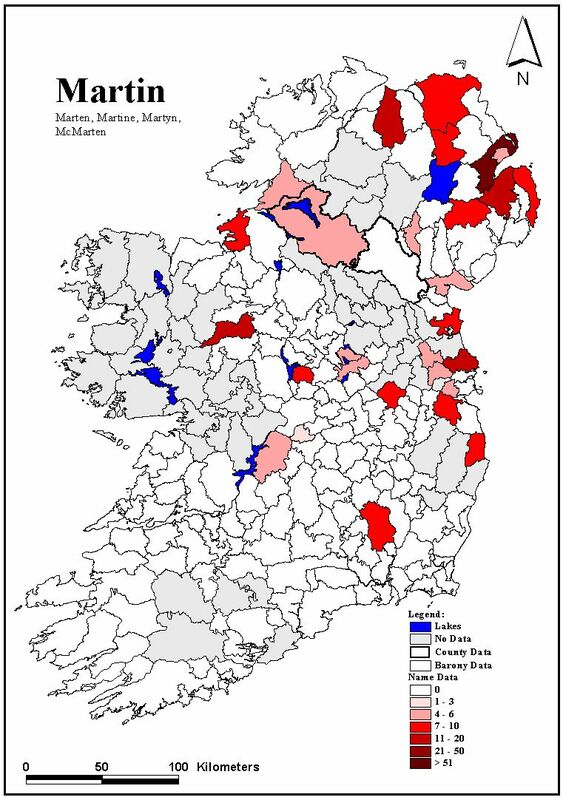 Clearly the fostering of the Irish language by the southern state and its neglect in the northern state played a critical role here. Whatever the period involved, the extent to which ruling elites and their associated political and social formations foster or do not foster a particular language has a profound effect on many aspects of a culture, not least both on the name forms themselves and the terrains of discourse about names, places and identities. The geographical study of Irish first names and second names is still at an early stage. This section only touches the surface of some of the major contours that describe and encompass this vast territory. It is true that we have explored and mapped some essential elements in the mosaic. But it is also clear that many stories about changing ideologies, linguistic encounters and competing terrains of discourse have still to be elucidated and written to better understand the major cultural forces shaping these shifting worlds of naming and names and associated identity constructions. Nevertheless an initial mining of the relevant sources is useful for both dismantling some inherited myths and for raising a series of questions. Greater precision about the beginning dates for a range of Christian names and surnames is very helpful for both dating and mapping a range of placenames containing these elements. An analysis of the hegemonic battles between the Celtic/Irish/Gaelic and the Germanic/English/British traditions may also both amplify and obscure other minority voices that echo ever so faintly down the centuries. It is possible, for example, that one of the first great phases of (re)gaelicisation post-dates the Scandinavian-Irish encounter? Likewise, the geographical expansion of medieval Norman-English naming systems is impressive in scope. However, we are still unclear about the regional extent and naming impact of the so-called Gaelic resurgence of the later Middle Ages. Even more striking and requiring much more research is the full story of the geography of the most recent regaelicisation phase from c.1850 and especially from the 1880s. (47) There have therefore, been a series of powerful ebbs and flows between gaelicising and anglicising forces and in all these phases Ireland emerges as complex, plural, fragmented and regionally diverse. There remains a whole series of mysteries relating to the survival or non-survival of particular name forms. Why, for example, did ‘O’ and ‘Mac’ remain so strong in certain family surnames and totally disappear in others. And in the most recent regaelicisation phase, why is it that there is a host of Irish names such as Boland, Brophy, Connolly, Garvey, Hennessy, Larkin and Murphy where the prefix is rarely if ever resumed? Likewise much work needs to be done on the shuffling and interaction of name forms as between immigrant and local families in the early modern era. The data-sources for the seventeenth as well as the nineteenth and twentieth centuries are relatively good—but the crucial naming worlds of the eighteenth century, often bilingual and bicultural—still require much attention. So do the complex stories and issues pivoting around names and identities. And finally, right across Europe for many centuries names placed the individual in his or her family, community, gender and class. (48) However in recent decades the choice of first names has at least been partially liberated from the constraints of family and religion as fashionable new names come and go. In contrast traditional naming systems connected the individual or family to social structures and cultural formations that were more permanent and slower to change. It is these powerful continuities and their transformations that have been at the heart of this geographical analysis. (49) It is to be hoped that the completion of the Atlas project in the near future will provide further understanding of the complex processes which, varying over time and space, shaped the highly diverse and plural heritage of Irish family names. E. Estyn Evans, The personality of Ireland: habitat, heritage and history (Belfast, 1981), p.42. See, for example, Derek Gregory, Geographical imaginations (Oxford, 1994); Catherine Nash, Remapping and renaming: new cartographies of identity, gender and landscapes in Ireland in Feminist Review 44 (Summer 1993), pp.39-57; Gerry Smyth, Space and the Irish cultural imaginations (New York, 2001), especially pp.40-55; And for a very good regional study of surnames, see Jack Burtchaell, The geography of Déise surnames , Decies 50 (Autumn 1994), pp.37-59. Séamus Pender (ed. ), A Census of Ireland circa 1659 with essential materials from the poll money ordinances 1660-1661 (Dublin, 2002) with a new introduction by William J. Smyth, v-lxii. 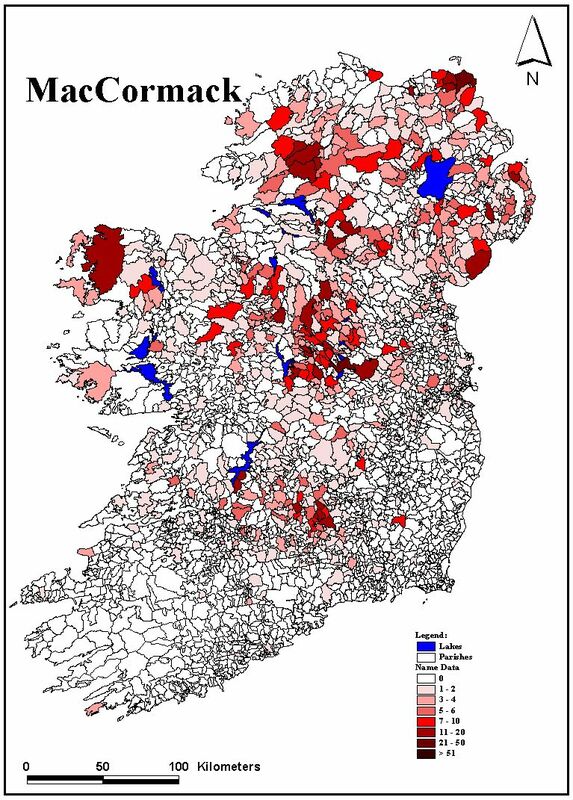 William J. Smyth, Society and settlement in seventeenth century Ireland: the evidence of the ‘1659 Census’ in William J. Smyth and Kevin Whelan (eds) Common ground: essays on the historical geography of Ireland (Cork, 1988), pp.55-83. T. Jones Hughes, Society and settlement in nineteenth century Ireland in Ir. Geogr. , 5, 2 (1965), pp.79-96. Art Cosgrove, Hiberniores ipsis Hibernis , in Art Cosgrove and Donal McCartney (eds), Studies in Irish history: presented to R. Dudley Edwards (Dublin, 1979), pp.1-14. Thomas Laffan, Tipperary's families: being the hearth-money records 1665-6-67 (Dublin, 1911). William J. Smyth, Property, patronage and population: reconstructing the human geography of mid-seventeenth century County Tipperary in William Nolan (ed. 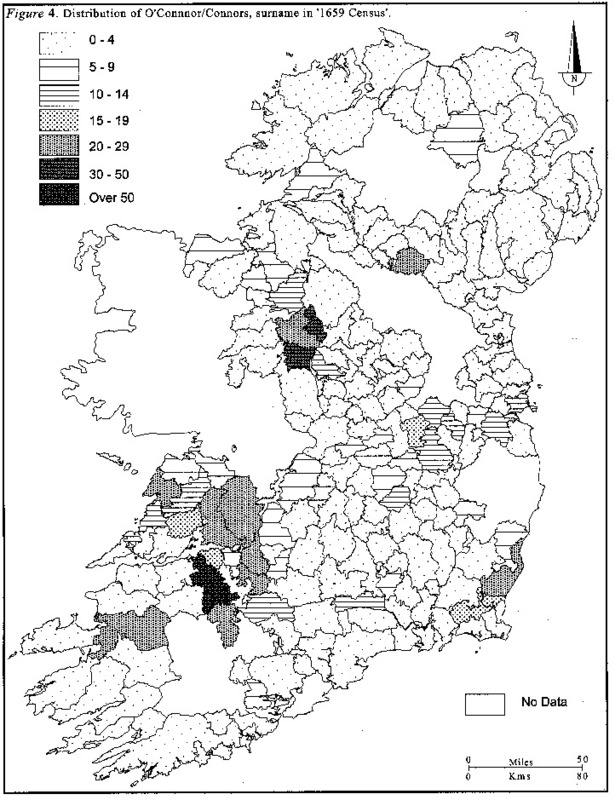 ), Tipperary: history and society (Dublin, 1985), pp.104-38. Donnchadh ó Córraín and Fidelma Maguire, Gaelic personal names (Dublin, 1981), p.1. The Annals of Ulster (to A.D. 1131), Seán Mac Airt and Gearóid Mac Niocaill (eds), (Dublin, 1983). My thanks to research assistants Ms. Almar Barry in particular and Ms. Millie Glennon for marathon work on this source. Rolf Baumgarten (ed. ), Old Irish personal names : M.A. OBrien's ‘Rhys Lecture—Notes, 1957’; Celtica , x (1973), pp.211-36. Annála Rioghachta éireann: Annals of the Kingdom of Ireland by the Four Masters from the earliest period to the year 1616 edited by John O'Donovan, 7 vols (Dublin, 1857, reprint New York, 1966). Edward Mac Lysaght, Irish families: their names, arms and origins (Dublin, 1991), pp.34-35; see also his Christian names in Ireland , North Munster Antiquarian Journal , 13 (1970), pp.53-56. Rev. L.P. Murray (ed. ), County Armagh hearth-money rolls A.D. 1664 , Archivium Hibernicum , 8 (1936), pp.121-202. Brian ó Cuív, Aspects of Irish personal names (Dublin: Institute for Advanced Studies, 1986), pp.3-36. As ó Cuív emphasises, the genealogies as well as the Annals are the primary sources for the study of early Irish names. The key text here is M.A. O'Brien's Corpus genealogiarum Hiberniae (Dublin, 1976). MacLysaght, Irish families , op. cit., p.34. This analysis is based mainly on the typescript summaries of Trinity College Dublin MSS812-39, involving depositions concerning the Irish insurrection of 1641 with additional materials from the original manuscripts. My thanks to research assistant Ms. Millie Glennon for assistance in this area. For a detailed analysis of this source, see Nicholas Canny, The 1641 depositions as a source for the writing of social history: County Cork as a case study in Patrick O'Flanagan and Cornelius G. Buttimer (eds. ), Cork: history and society (Dublin, 1993), pp.249-308. Richard M. Flatman (ed. ), Some inhabitants of the baronies of Newcastle and Uppercross, Co. Dublin, c.1650 in The Irish Genealogist , vii (1989), pp.496-503 and pp.3-14. Mac Lysaght, Irish families , op. cit., p.35. Stephen Wilson, The meaning of naming: a social and cultural history of personal naming in Western Europe (London, 1998), pp.86-114. Patrick Woulfe, Sloinnte Gaedheal is Gall: Irish names and surnames (special revised edition, Irish Genealogical Foundation, Kansas, 1992), xxvii-xxxi. Edward Mac Lysaght, More Irish families , (Dublin, 1996), p.91. Wilson, op. cit. , pp.115-18. Brian ó Cúiv. Irish personal names op.cit. , pp.31-34. The Annals of Inisfallen (Ms. Rawlinson B.503) edited with translation and indexes by Seán Mac Art (Dublin, 1951); see especially Index of personal names , pp.444-509. Key Norman names itemised after 1170 in the Annals of Inisfallen include Condon 2, de Barri 5, de Burgo 6, de Cocán 3, Fitzgerald 6, Mac Gerailt 5, Mac Uigilin, Mac William, Prendergast and Roici (i.e. Roche) 7. Mac Lysaght, Irish families, op. cit. , p.17. Woulfe, Sloinnte Gaedheal , op. cit., xxxii. The Irish fiants of the Tudor sovereigns—during the reigns of Henry VIII, Edward VI, Philip and Mary, and Elizabeth I (Dublin, 1994), vols I and II. Edward Mac Lysaght, Irish families , op. cit. , pp. 199-210. For his discussion of the names King, Martin and White see his The Surnames of Ireland (Dublin, 1980), pp.183, 209 and 229. William J. Smyth, Wrestling with Petty s ghost—the origins, nature and relevance of the so-called 1659 Census , new introduction to Pender's A Census of Ireland circa 1659 , op. cit., v-lxii. Philip S. Robinson, The Plantation of Ulster: a British settlement in an Irish landscape 1600-1670 (Dublin, 1984). William Macaffee, The colonisation of the Maghera region of South Derry during the seventeenth and eighteenth centuries in Ulster folklife , 23 (1977), pp.70-91. See also William Macaffee and Valerie Morgan, Population in Ulster 1600-1700 in Peter Roebuck (ed. ), Plantation to partition (Belfast, 1981). See, for example, Brendan Adams, Surname landscapes—Leitrim in Bulletin of the Ulster place-name society , i.2 (1978) pp.27-39; also in same journal his Surname landscapes in Fermanagh iii.2 (1980) pp.56-68; Bryan S. Turner, An observation on settler names in Fermanagh in Clogher Record , viiii (1975) pp.285-289. Mac Lysaght, Irish families, op. cit. , p.21. Robert E. Matheson, Special Report on Surnames in Ireland (Dublin, 1909) [together with] Varieties and Synonymes of Surnames and Christian names in Ireland originally published in Dublin (1901) reissued as two volumes in one by Genealogical Publishing Co. Inc., Baltimore, 1982. Mac Lysaght, Irish families , op. cit., p.31. This section is based on an analysis of the barony by barony lists of surnames from Griffith's Valuation as indexed county by county in National Library of Ireland, Dublin. My thanks to Mr. Gerry Lyne (NLI) for his assistance in this area and to research assistant Ms. Millie Glennon for her detailed work on this source. In addition, Mr. David Joyce, Ms. Joanne McCarthy and Ms. Elaine Cullinane have done great work on the computer mapping of both the Valuation and the ‘1659’ Census. Mac Lysaght, Irish families , op. cit., p. 31. National Archives, Ms 4921, Revd. B. O'Keeffe's manuscript returns (1904) of diocesan census of Cork, Cloyne and Ross (1766). See for example, Patrick W. Joyce, The origin and history of Irish names of places , vol III (Dublin, 1913); and the first edition of Woulfe's Sloinnte Gaedheal in Gall was published in 1906. P. Grant, Producing national space: the iconography of streetnames in Munster (2000), unpublished M.Phil thesis, Department of Geography, UCC. The following analysis is based on a study of surname listings in the telephone directories for all of the Republic and Northern Ireland 1990-2001. Mac Lysaght, Irish families , op. cit. On a broader cultural front, see Jeanne Sheehy, The rediscovery of Ireland's past: the Celtic revival 1830-1930 (London, 1980). See also Jim MacLaughlin, Reimagining the nation-state: the contested terrains of nation-building (London, 2001), especially pp.165-209. Wilson, The means of naming , op.cit., p.337. 50. My final thanks go to Orla O'Sullivan and Suzanne O'Sullivan who magically deciphered the succession of manuscripts and to Neil Buttimer, Jim MacLaughlin, Máirín Ní Dhonnchada and Vera Ryan for their helpful comments on the text itself. In order to create the surname maps for this project, two different sources of data were used. 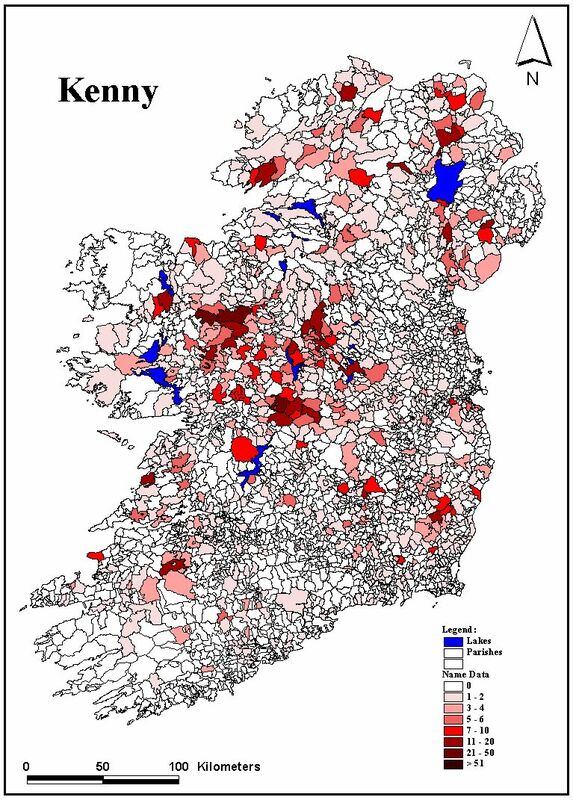 These two sources, namely Griffith's Valuation of 1850/51 and Petty's so-called ‘1659 Census’ of Ireland, have provided data on surnames which was then mapped using a specific GIS programme called ArcView (see section IV). The two data sources used provide quite different types and distributions of data. Griffith's Valuation provides numerical data, on a parish level, of the number of households bearing a particular surname. This ensures that the data could then be mapped on a parish, barony and county level if so required. Petty's ‘1659 Census’ provides numerical data, on a barony (or sometimes county) level, of the number of adults bearing a specific principal family name. As explained in the introduction and using Edward Maclysaght's seminal work on the forms of The Surnames of Ireland (1985), a selection of names were mapped using the Griffith's Valuation data. All of the principal names from the 1659 Census were mapped. The so-called ‘1659 Census’ was compiled by Sir William Petty by abstracting the numbers for and names of the adults returned as paying a poll tax. The poll tax was carried out, for the most part, in the year 1660. 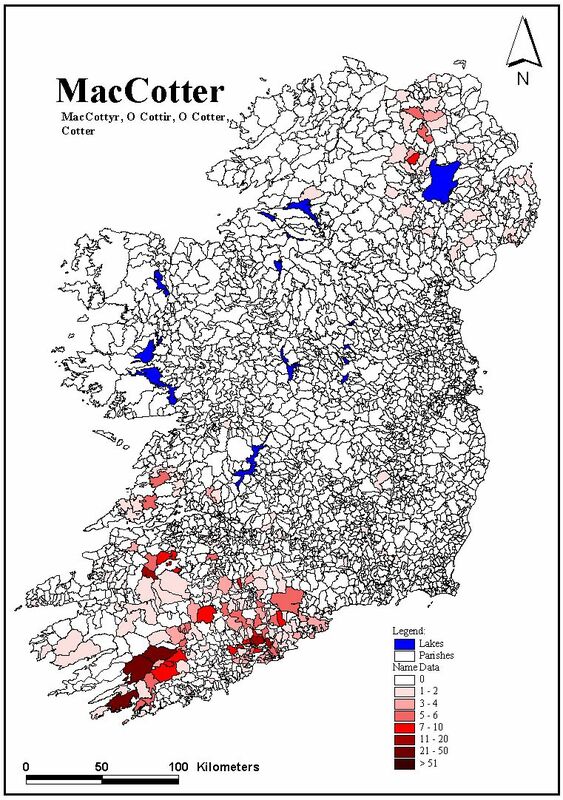 The so-called ‘Census’ is arranged by divisions of counties, baronies, parishes and townlands, and where applicable, by cities, parishes and streets. The most influential people in society were identified as Tituladoes , a term coined by Petty himself to describe those individuals who are returned as paying the highest taxes. It is thought that Petty wanted, in particular, to ascertain the ethnic divisions and proportions within Ireland at the time. Therefore a section at the end of each barony analysis was devoted to enumerating the numbers of Irish vis-à-vis Scots and English living within each barony. In particular, a numerical list was made of the ‘Principal Irish Names’ for each barony. There are, however, a few difficulties with using the 1659 Census as a source of data. Because this document is, in fact, based on a poll tax, it is not a full ‘census’ of the population at the time but rather of numbers of adults paying tax. It is probable that most single adult males and females who were not servants or employed were excluded from the taxation and, therefore, the record. As another example, holders of ecclesiastical positions are not included in the returns as they were exempt from payment of the poll tax. The greatest difficulty with the Census however, is the fact that some data is missing. 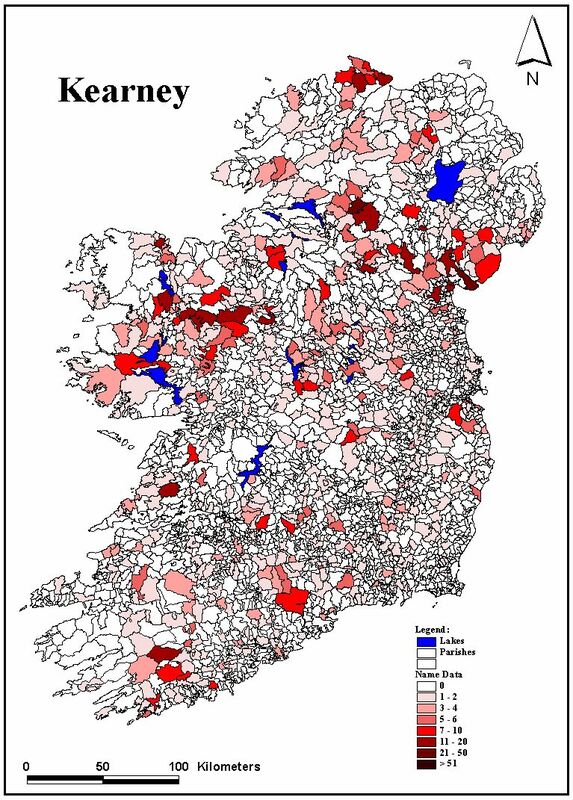 There is no data for five counties in Ireland, these being Cavan, Galway, Mayo, Tyrone and Wicklow. 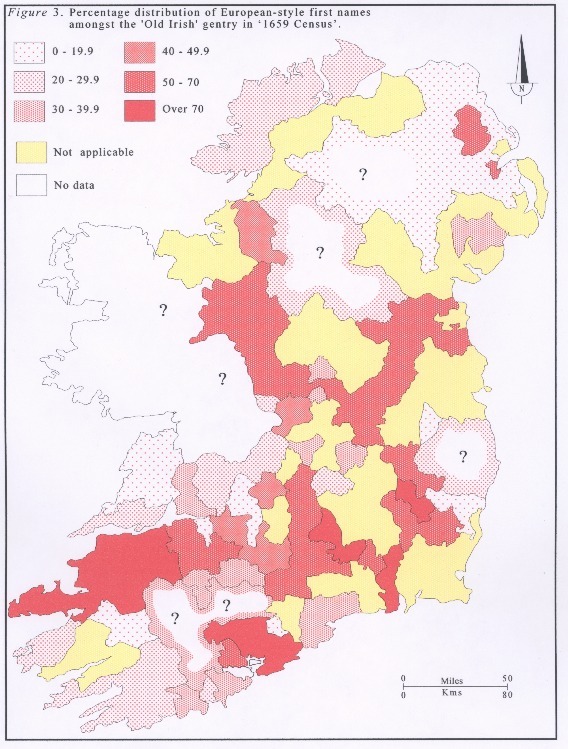 Data is missing for four baronies in Cork and nine baronies in Meath. The data for Co Fermanagh and Co Monaghan is available only on a county level. Therefore special provision had to be made for these situations when creating the surname maps. Another difficulty involved in the use of Petty's Census is the changing of the barony boundaries themselves. Since the seventeenth century, many baronies have either been enlarged or reduced, yet the baseline digitised map we have been using is based on the barony boundaries of the nineteenth century. Much time was expended in ascertaining where the old barony boundaries begin and end, and changing the digital map layout to accurately portray the seventeenth century data. The aim of this part of the project was to map all of the principal names that occurred in Ireland in the mid-seventeenth century. For this purpose, all the principal names contained in the index of the 1659 Census were noted. There were, in total, 2365 ‘principal family names’. A sizeable part of the project was to then to investigate how this range of surnames would be mapped. This meant including all the possible variations of a particular surname into a single category. For example, there were sixteen variations on the name Brien, all of which had to be gathered together. Eventually the number of surnames arrived at to be mapped was close on 700. This was, at times, a very difficult process. Names that may appear to be quite similar may not, in fact, have any relation to one another. Though we followed MacLysaght as closely as possible, sometimes other considerations also affected the decision whether to assimilate or distinguish certain surnames. The anglicisation of Irish surnames had already strongly developed by the mid-seventeenth century and in a number of cases as, for example, with forms such as Morrow, O Morroe, McMorey and MacMorrough, it is almost impossible to determine the original Irish names. However, attention to the baronial locations of particular names is helpful in this context. A database was created in Access to facilitate the input of data on a barony level. As a surname was found in a particular barony in the 1659 Census, the number of occurrences of that name was inputted in the Access database. This was a painstaking process, as there were, in effect, over 2000 names to process. Once this data capture process was completed, however, the data itself was converted into ArcInfo through a process known as spatial data-integration. ArcView was then used for the analysis of the data and for the production of the maps of the surnames in the 1659 Census. It is notable that in the index to the surnames mapped in the 1659 Census, many more ‘usual’ surnames do not appear in their familiar form, if they appear at all. For example Buckley, whilst a numerous name in Ireland today, does not appear even once in the 1659 Census. In a similar fashion, O Sullivan, very numerous today in the Cork and Kerry region, does not appear in its more usual form in 1659—all the ‘(O) Sullivans’ are returned as ‘Sullivane’ in 1659. However, other O'Sullivans, MacCarthys, Fitzgeralds and probably Burkes and Ryans are obscured by the continued use of a range of patronymics such as MacTeige, MacDonagh, MacDaniell, MacShane, MacJames, MacThomas, Fitzmaurice and Fitzwilliam in 1659. 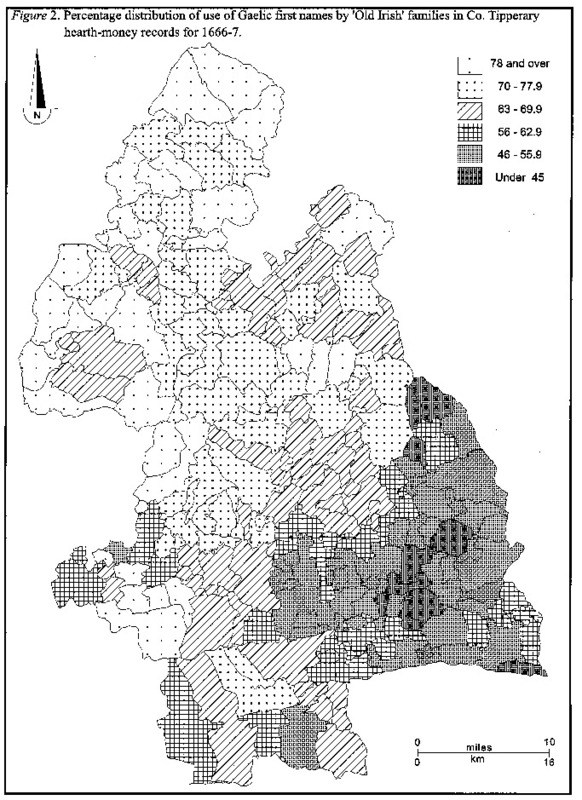 Griffith's Valuation provides details of households at the much more detailed parish scale. 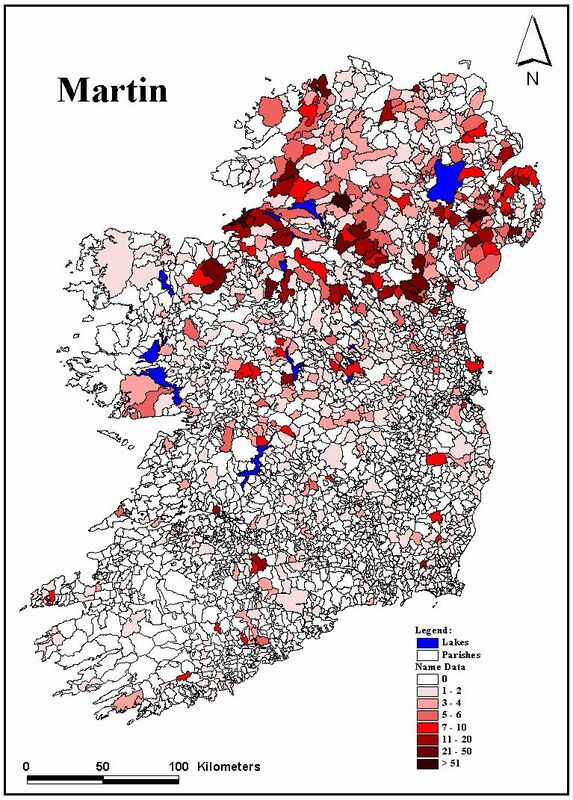 There are approximately three thousand three hundred civil parishes in Ireland, as opposed to just over three hundred baronies used in Petty's Census. The ‘Index of Surnames’ abstracted from Griffith's Valuation was the source of our mapping data. This index gives alphabetical listings of all of the surnames located in each civil parish in Ireland. Therefore it is possible to document and map the number of times each surname appears in each parish. A database was created in Access containing the number of times each surname occurred on a parish, barony and county level. As a surname was found in a parish in Griffith's Valuation, it was documented in Access. In Access, each parish had its own identifier. In a similar manner to the methods used for the 1659 Census, once this data capture phase was completed, the data was inputted into ArcInfo through a process known as spatial data-integration. Essentially, each parish with its unique identifier in Access was matched up with a polygon that represented the corresponding parish in ArcInfo. This enables the distribution of each of the family names to be mapped not only at the parish level, but also, if necessary, at barony and county levels. The anglicisation of Irish surnames to English forms had accelerated rapidly by the mid-nineteenth century. This is clearly illustrated by the names King, Martin and White. King is usually an English-derived name in Ireland. But since the seventeenth century it has also been widely used as an anglicised form of several names assumed to be connected with the term ‘Rí—King’. For example the names Conry, Conroy, Cunree, MacAree and MacKeary have all been anglicised as King. However, in the 1659 mapping, King is uniquely associated with Co. Westmeath—and this is likely to represent the rare name ó Cionga which belongs to the shores of Lough Ree. By the time of Griffith's Valuation, the surname King has assimilated a number of such distinct Irish names. Likewise, the surname Martin—which is widespread in Ireland as well as in England and Scotland—is in Ireland linked with this Galway Anglo-Norman family , the old Gaelic family name Gilmartin, as well as the MacMartins in Tyrone and the ó Martins of Westmeath. (See Atlas Abstract part VI). And finally, the English name White is often in Ireland of Old English origin, for which de Faoite is the Irish form. But by translating names linked with such words as bán and geal, White often replaces Irish surnames such as Bane, Bawn, Galligan, and Kilbane. (See Atlas Abstract part VI). Thus, when mapping surnames from Griffith's Valuation, the researcher can only map the ‘composite’ anglicised name—such as King or Martin or White. By the 1850s it is not possible to identify the other underlying Irish surnames absorbed by a more inclusive, powerful name such as White. In looking at the origins of family names (and necessarily including forenames) we have documented in detail, firstly, from the Annals of Ulster , all the occurrences of such names, beginning with forenames, from c.770–c.1120. Similarly, and from the same source we have analysed the distribution of documented occupations between c.770–c.1120. This time framework has been divided into eight different time intervals. Each forename and surname is listed according to the particular time interval in which it first emerges. This data has been inputted into Microsoft Excel. With suitable editing and cross-referencing, these spreadsheets highlighted the distribution of forename and surname occurrences over time, while it also highlighted the evolution of occupations over time (See summaries in appendices). The Atlas of Family Names in Ireland project involves the creation of a substantial GIS digital map, a database archival system and a digital research tool. The following section describes in detail the process undertaken in order to create this GIS map and the name database. The data capture phase, of both map and attribute data formats, was a long and tedious one. The result was the creation of a valuable digital mapping resource with wide application within historical geographic research. The process began with the digitising of the 1841 civil parish boundaries. This was undertaken as part of the ‘Irish Famine Maps Project’ by the Department of Geography at UCC. The digital maps thus created for the Famine Maps Project are now used as the base maps from which the Atlas of Family Names in Ireland digital maps are produced. The 1841Census of Ireland was the first detailed census ‘survey’ to be taken based on the almost completed original six inch to one-mile OS map survey of Ireland. It was therefore the obvious choice as the source material for the capture of civil parish boundaries. By the early 1990s Geographical Information Systems (GIS) had emerged as an ideal tool to help geographers uncover information from diverse sources of physical and human geographic data. A computer-based GIS could be used to capture, organise and analyse the mass of data contained in the ‘1659 Census’ and in Griffith's Valuation of the 1850s. The GIS enabled a structured approach for analysis and graphic visualisation that could lead to new insights into the trends and distributions in the name database. 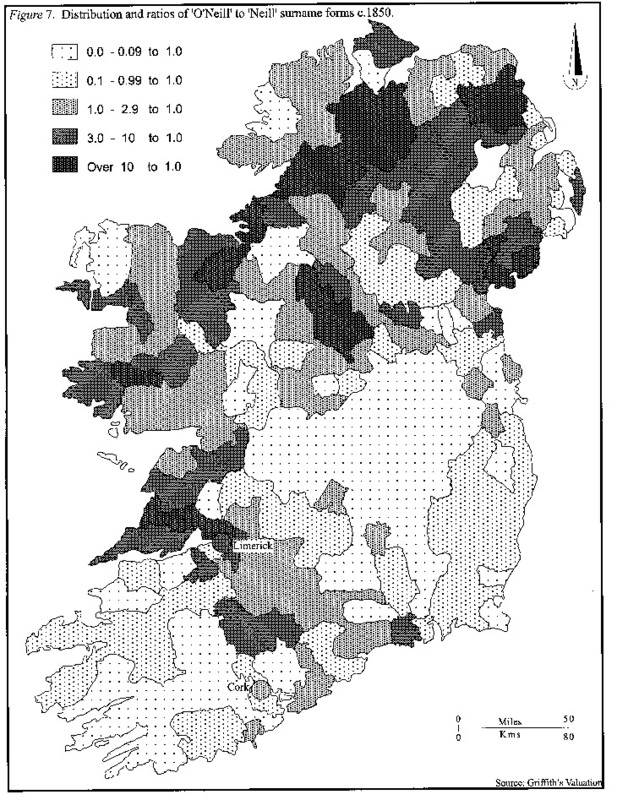 The Irish Famine Maps and Irish Family Names Atlas projects presented a classical GIS problem. All of the original source documents (containing both the map and attribute data) were paper-based. The aim was to create a digital map framework representing the parishes and towns to which the name data could be linked. This would facilitate the input of queries to create different views of the data, isolating or combining certain items in the database, the results being presented in choropleth maps. No digital copies of the six-inch map series reflecting the 1841 Civil Parishes were available. In order to create the framework map it was necessary to find a suitable paper map to digitise. It would not be feasible to digitise the individual six-inch maps; it took thousands of maps at this scale to cover the entire island. A survey accurate map was not necessary; what was needed was a map graphic at a resolution sufficient to accurately reflect the data on a computer display or in an A4 or folio sized publication. Equally important was a source map that could be digitised within a reasonable time frame. The index sheets to the six-inch map series were chosen as the source maps. Each county had its own index sheet. The map outlined the numbered six-inch sheets that covered that county. It shows the barony and parish boundaries and the location of the towns and villages. It also showed the junctions with adjoining counties. This was very important for the later joining of the individual digitised counties. The index maps were on standard sized sheets so many of the counties were mapped at different scales. This meant that joining the maps was one of many non-trivial issues to be resolved. In order to digitise a paper map it must first be registered on the digitising table. For this a series of geographic control points or Tics must be created, a half dozen or more control points that would contain and span the county to be digitised. Ultimately thirty-two maps would be digitised separately and joined to form the national map. To facilitate this joining a national series of Tics had to be created; each accurately positioned at the county junctions and uniquely identified by a number—the TicID. Almost all of the Tics would be common to more that one county map. The Index map shows the county junctions but there is no grid reference system on these maps. Each junction had to be identified on the modern half-inch map series and an accurate grid reference generated. This led to a series of Tics covering the entire island each with a unique TicID and an accurate Grid Reference. The manuscript map is first captured in digitiser coordinates, in this case digitiser inches. It then has to be transformed into real world coordinates, into Irish National Grid coordinates, using GIS functions. The national series of Tics file with their associated Grid References was also used to enable this transformation. GIS projects like this requires a seamless integration between the various elements of the hardware and software systems. PCArcInfo was chosen as the initial GIS package for map data capture because of its extensive digitising and editing facilities. Digitising could not begin until PCArcInfo was successfully installed and interfaced with the digitising table. The PC had to have sufficient memory and resources to do the work and to facilitate the crucial regular back-up of data. This assembly and integration of systems was another non-trivial issued to be resolved. PCArcInfo, though ideal for digitising, does not have a user-friendly interface for data entry, analysis or map creation. This was part of the reason for using a ‘flat file’ structure rather than a relational database structure. Though less efficient because of the duplication of some records, barony and county names for example, this ‘flat file’ simplified exporting the database to other software packages for easier data entry and editing. Because of the historical nature of the material there would not be any updates to the map database. Modern PC systems can easily handle the fixed size of the map database with considerable amounts of attached data. ArcView has extensive data browsing, analysis and map creation facilities. This was chosen as the GIS package used to integrate the digitised maps and the family name database, to analyse and view the data and to create numerous choropleth maps. County Cork was chosen for the digitising trial. Many more non-trivial issues now presented themselves. The census data for each county is organised by barony, listing the parishes alphabetically and including in each parish any existing towns. The digital equivalent of a paper map sheet is called a coverage. The parish is an areal object represented in the GIS coverage as a polygon. The town is a point object, represented in the GIS coverage as a point. PCArcInfo, like most GIS packages at the time, did not allow points and polygons to be stored on the same coverage. Each object within a coverage has to have a unique identifier so that the GIS can keep track of the object and its attached data. The parish/polygons and the town/points had to be stored in separate coverages and each had to have its own unique series of numbered identifiers. Each county would therefore have two coverages, a polygon coverage representing the parishes and a point coverage representing the towns. The parish/polygon coverage is the more complex and formed the base map used to generate the barony map for the Family Names Database. The parish polygon is a series of arcs representing the borders of the parish joined at nodes to form an enclosed area. Adjoining parishes can share arcs and nodes to form their representative polygons. Each polygon must contain a label with an associated unique identifier—the UserID. The name of the parish, its area, its barony and county and all associated data is linked to that parish through this unique UserID. The trial digitising of County Cork was done relatively quickly and the polygon labels with associated UserIDs were created automatically using a PCArcInfo option. A number of important issues became apparent at this stage. Spurious arcs and polygons were created if the digitising was not done carefully. During the automatic creation of labels these spurious polygons were also allocated labels and UserIDs. The time needed to find these spurious arcs and polygons and correct them was significantly longer that the time needed for an original careful digitising. There was also the issue of empty spaces within the county map. This came about because a significant number of parishes had detached portions. As the parishes were being digitised any detached portions had to be found, digitised and allocated the same UserID. Otherwise there would be errors in the map database and ‘holes’ in the choropleth maps. The County Cork trial made it very clear that only a meticulous and painstaking approach to the digitising would ensure that the resulting map and attached database would be accurate without having to undertake significant post digitising editing. Each parish was given by hand a unique UserID from 1 to circa 3,300. A similar but separate UserID scheme was used to identify the towns. Digitising proceeded as follows: The appropriate index map sheet was registered on the digitising table. The census was referenced for the next parish to be digitised and its name, UserID and area in acres noted. The Index to the Townlands and Towns, Parishes and Baronies of Ireland was referenced to check for any detached portions and for the numbers of the six-inch sheets that contained the parish. This helped to locate the parish on the index map sheet. The boundaries of the parish and any detached portions were noted on the index map sheet. The paper source was prepared by highlighting where needed the outline of the parish and noting and highlighting the location of nodes that would be shared with adjoining parishes. The parish outline was then digitised and the label added and allocated the noted UserID. After each barony was finished, the coverage was checked for errors using PCArcInfo's editing functions. This identified any unclosed polygons or polygons without labels. After errors were corrected the next barony was digitised until the county was completed. Completed counties were transformed from digitiser inches to national grid coordinates. They were then joined to form provinces and provinces joined to form the national map. Some careful editing was also needed after each join operation to eliminate errors along the junction of joined counties or provinces. This approach resulted in an average digitising rate of 10 polygons an hour. This is also the average rate suggested in most GIS references books. In many cases the original six-inch map series held in the Boole Library had to be consulted in order reconcile conflicts between the census data, the index to the six-inch maps and the Index to Townlands , all of which have different publication dates. The aim always was to model the parishes and towns as they appeared in the 1841 Census. In all it took two years to complete the digitising of more that 3,000 parishes and 1,500 towns. A digital mapping system facilitates the creation of new maps based on the underlying data. The parish/polygon map was used to create the barony map for the 1659 family name data. By merging parishes within the same barony to form larger polygonal areas a new barony map was created. The resulting map was compared to the 1659 list of baronies to ensure accuracy. The entry of large amounts of data into database records can be a long and tedious process prone to errors. To help in this process a new database was created. The surname data was used for the column headings and the parish and barony names used for the row headings. The unique parish and barony UserIDs were also included. A form for data input into this database was created in Access. This set up a user-friendly interface that made data capture easier and data entry errors less likely. To further simplify the process this data capture was done independently of the map data. The UserIDs would be used later to link the data to the objects in the map database. The input form allowed the user to pick a parish or barony and enter the name data in a structured user-friendly form. The form allows the user to select a barony from a list. The computer then automatically returns to the user a list of all parishes in that barony. The user then simply selects the parish they wish to enter data for and the computer automatically updates the database once the family name data has been entered. The name data was entered for each parish and barony through this input form and stored in tables in the new name database. When the attribute name data capture was completed it had to be linked to the map database. This was done in the ArcView GIS package using the UserID link field. The resulting map database was then used for detailed spatial analysis of the attribute name data and for the production of choropleth maps. ArcView was used for the analysis of the name data and for the production of the numerous maps. A specific statistical analysis was carried out to determine the ideal legend classification for the data being mapped. This analysis involved calculating the maximum, minimum, mean and standard deviation for the number of occurrences of each name in every parish and barony. This was done to ensure that all the maps depicted the data in a standard style that facilitated comparative examination. The result was a legend with seven divisions for the 1659 Census and a legend with eight divisions for the Griffith's Valuation. Both legends were applied uniformly across all the maps. This common legend structure and colour coding, greatly aids the visual interpretation of the mapped name data. Note: It should be noted that the 1659 legend deals with the number of adults bearing a specific surname in a barony : the Griffith's Valuation legend (c.1850) refers to the number of households bearing a specific surname in a civil parish . All maps are © William J. Smyth, Project Leader, Atlas of Family Names of Ireland, University College Cork, Ireland. First Names that carry through the eight 50 year periods from 770–819, 820–869, 870–919, 920–969, 970–1019, 1020–1069, 1070–1119 and post 1120 AD. Please note for Appendix 3 and 4 that only the English translation has been used to compile this occupational data. It is clearly necessary to assess these categories in their original Latin and Irish to fully confirm patterns of stability and change amongst occupational groups. This has not been attempted.